The “Call of the Wild” has been strong again this year ! 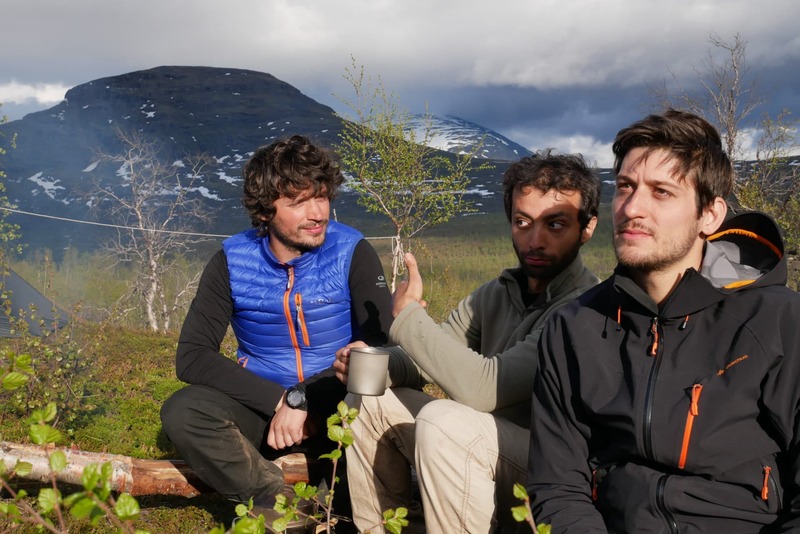 Of course we answered if : destination Swedish Lapland with Matthieu and Quentin in the Kebnekaise region for around ten days between Nikkaluokta and Abisko. 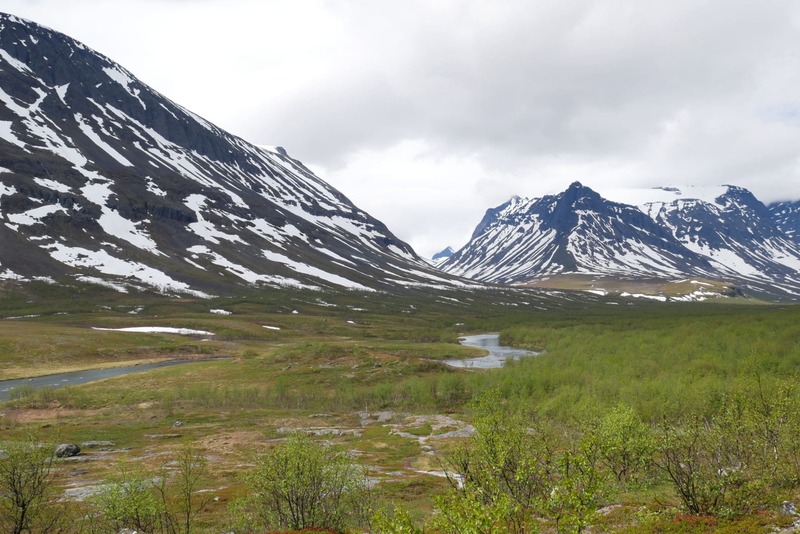 First we wanted to follow the Kungsleden between this two places but we had to change our plans a bit as I will explain later. For this trek, our main goal was to escape in the Great Outdoors with as little human contact as possible, in total freedom. 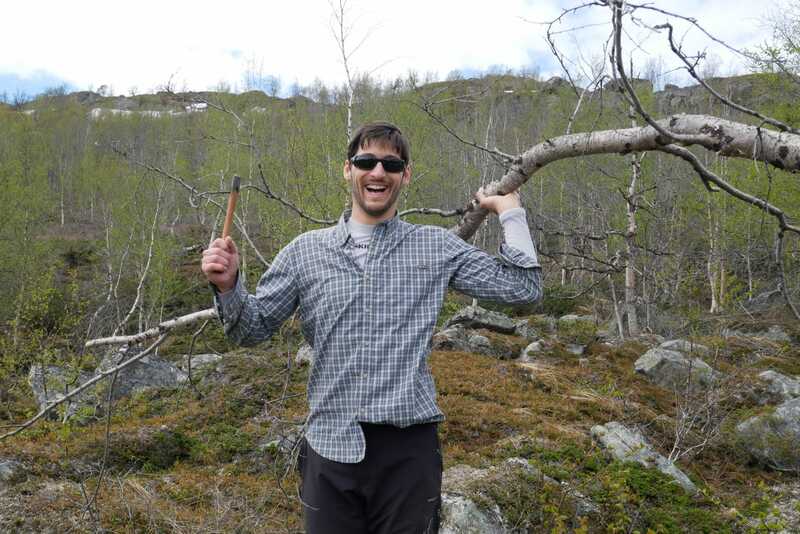 Sweden and Lapland are perfect for that ! 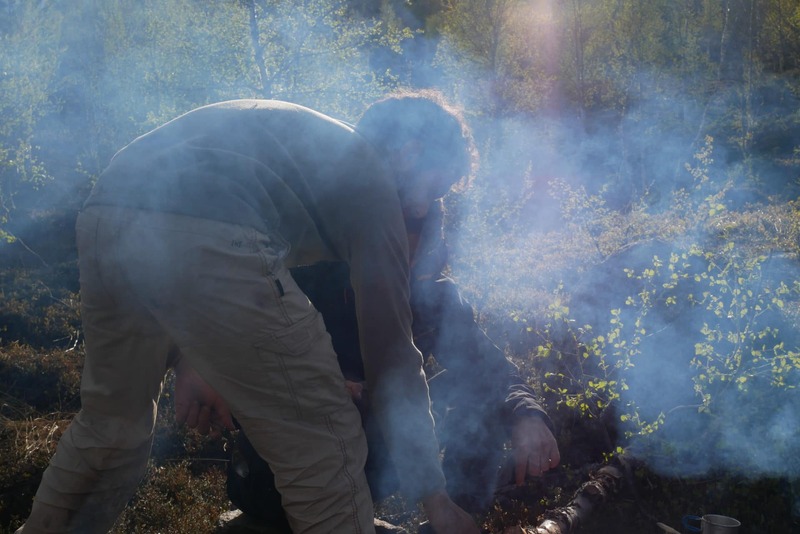 Follow us for this 9 days in the birch forest, the swaps or the snow, far for the civilization, alone and happy to be ! Our first wish was to go in a remote area with very little human contact and in which we would live the “Great Life”. 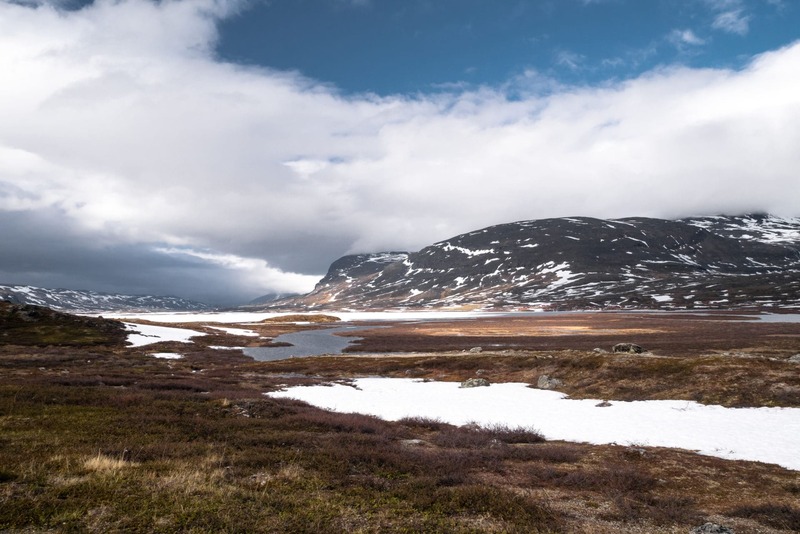 Sweden was perfect for that especially in the Lapland and thanks to the Allemansrätt law (More information about this law here). 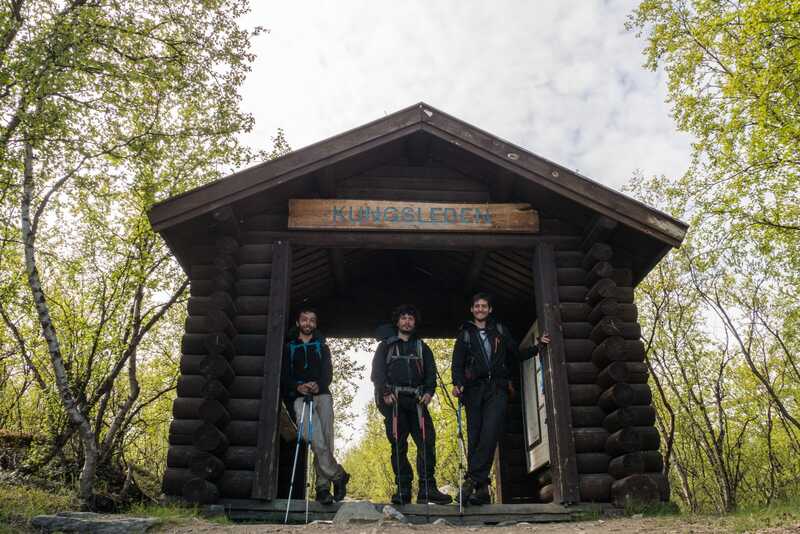 So we wanted to walk the Kungsleden between Singi and Abisko starting in Nikkaluokta but after few searches on the Internet et some feedbacks from the field, we chose to start in the Vistas valley first and then cross in the Mountains at the Raïtastugan hut and join the regular path after Nallo. 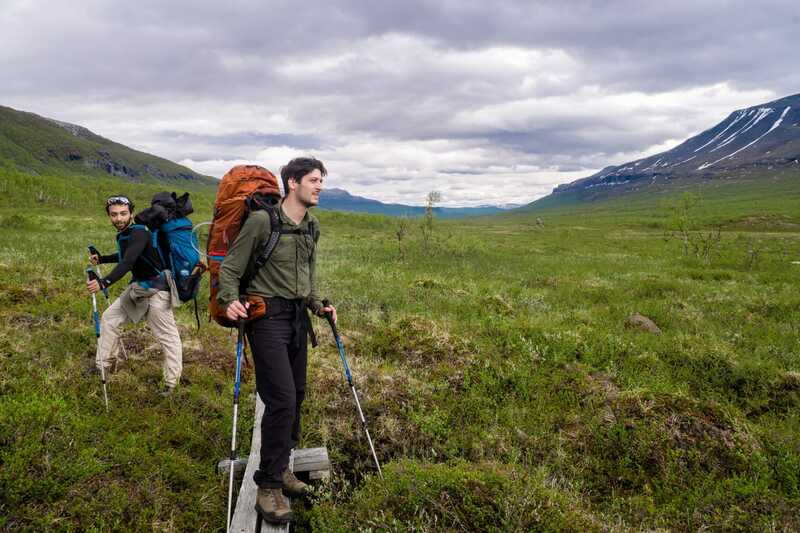 The Kungsleden, the Royal Path, is a 400km trek between Hemavan and Abisko. 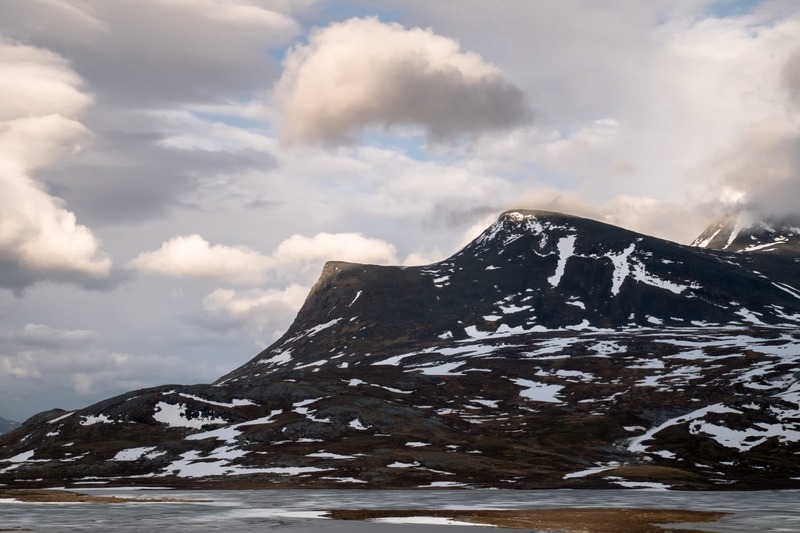 It crosses wild area of the north sweden as the Sarek, the Vindelfjallen ou Saltoluokta mountains. The Singi-Abikso portion is the most walked because there are shelters every 20km so one can do this part with a light backpack. The problem is that this idea was good but winter has been late this yer and there was still much snow from the locals feedback. Finally we started in Vistas valley as planned and then we crossed toward Alesjaure. 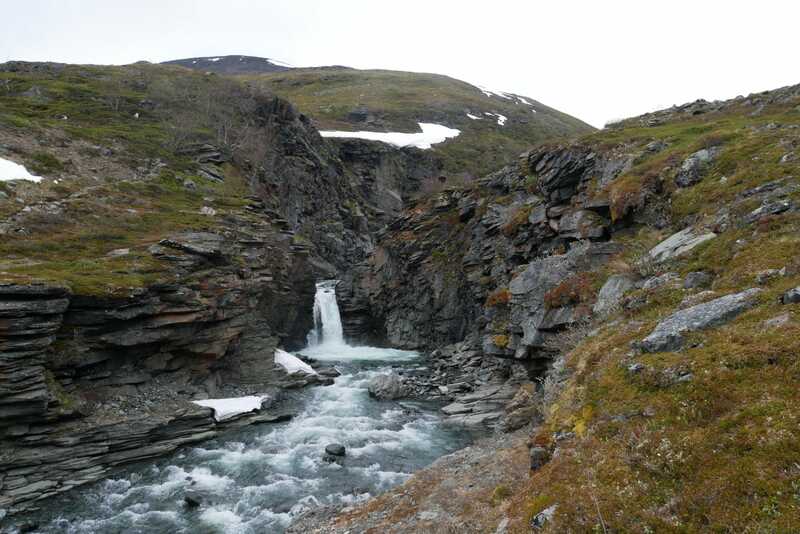 After that, to avoid meeting too much people, we went to the Gama and the Kårsavagge valley. 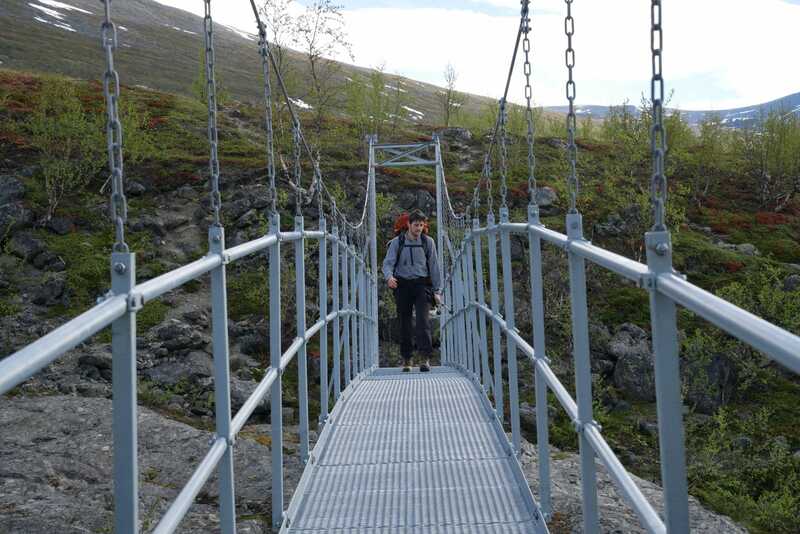 This was a interesting way, more remote than the Kungsleden and offering beautiful, unspoiled sceneries. Meeting is at 8am in Charles de Gaulle Airport, France. 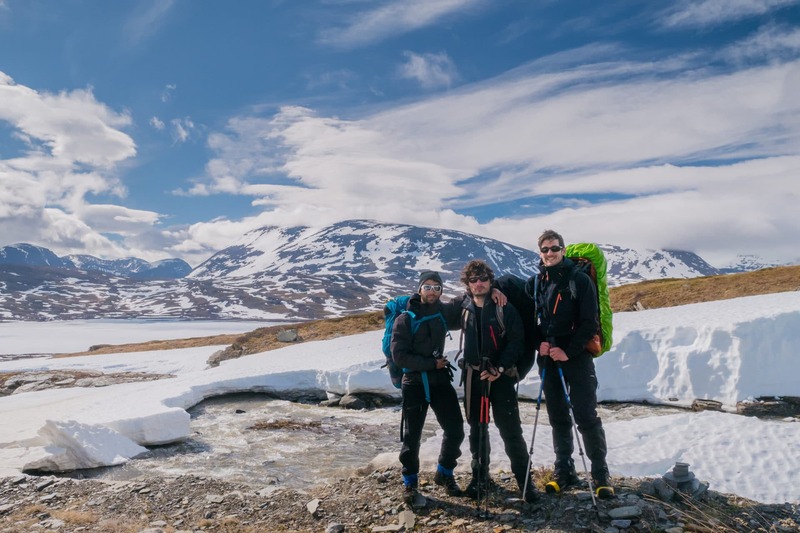 Quentin and Matthieu are there with their huge backpacks full of 10 days of food. Excitation is there to, we are eager to be in the wild soon. The 2h30 flight is quick. Here we are in Stockholm airport. We decided to continue our journey by train. It is a good way to take time, to adapt slowly to our new environment. But before that we have to wait for 5h in the airport. 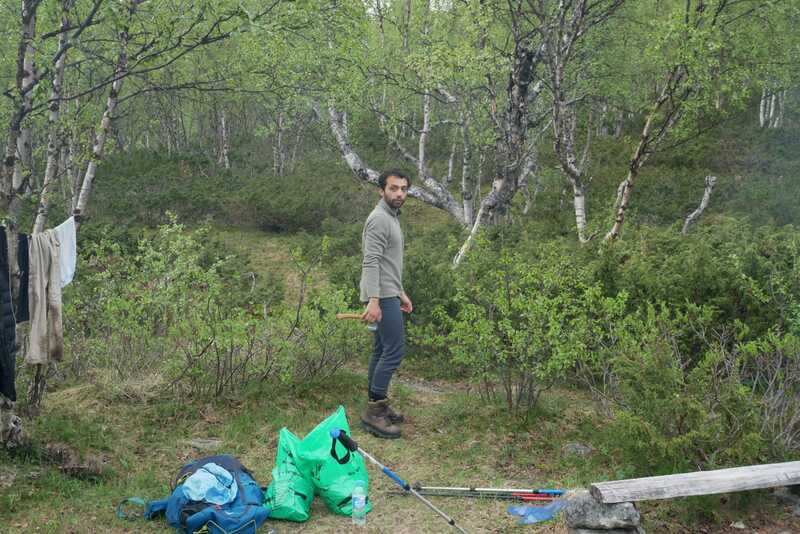 So we use this time to pack our bag and to check the path one more time. The train is leaving at 6pm, we have a compartment for three, it is a bit small but it will be ok for the night (there are also shower available). The evening will be spent playing cards and watching the landscapes flying through. It is a succession of lakes, forests and small town from time to time. Finally we arrive in Kiruna! The end of the journey is impressive because the train passes by the enormous iron mine of the city (27500 tons on iron are extracted every day). From the trainstation we go to the city thank to a free shuttle. 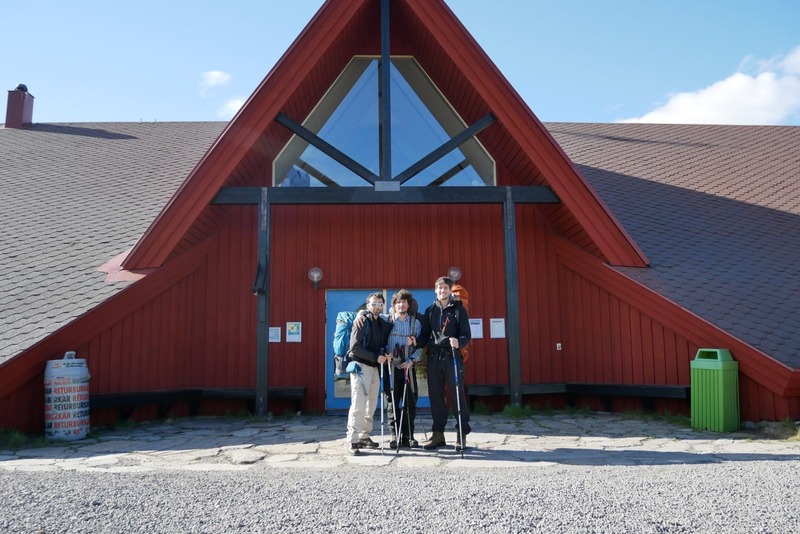 Then we go to the tourist office to have some informations about the ways to go to Nikkaluokta. One and half hour and a nap later we are finally in Nikkaluokta, the true beginning of our trip ! Not many things here : just a big building which is an hotel, a restaurant and a small shop but the best thing is that this is the end of the road ! Before we go we stop to check with the owner of the hotel to get more informations about the field conditions. She has no more news than the Lady at the turist office earlier. She just confirms us that the valleys are quite snowy and that it can be a bit difficult to walk there. At this moment some guys are just passing by and it appears that they are helicopter pilots here. 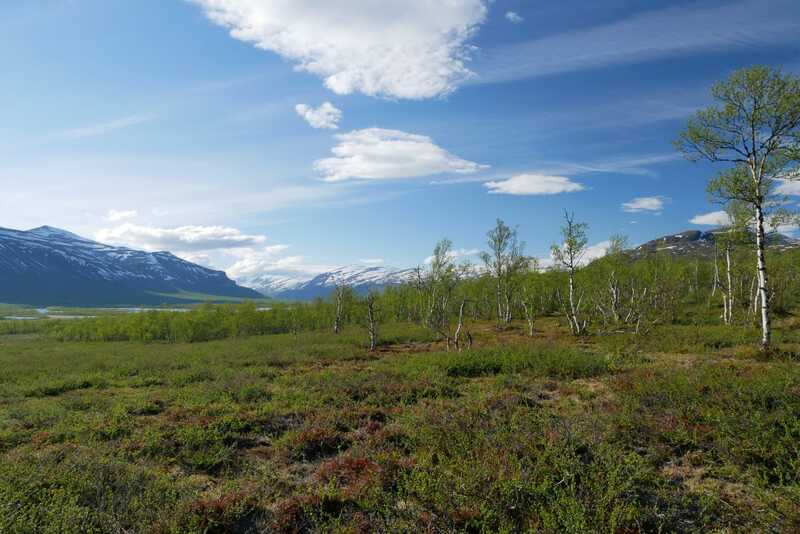 They are telling us that all the Kungsleden valley is almost full of snow from Singi to Abisko. The Vistas valley seems better but they don’t how is the end of it. 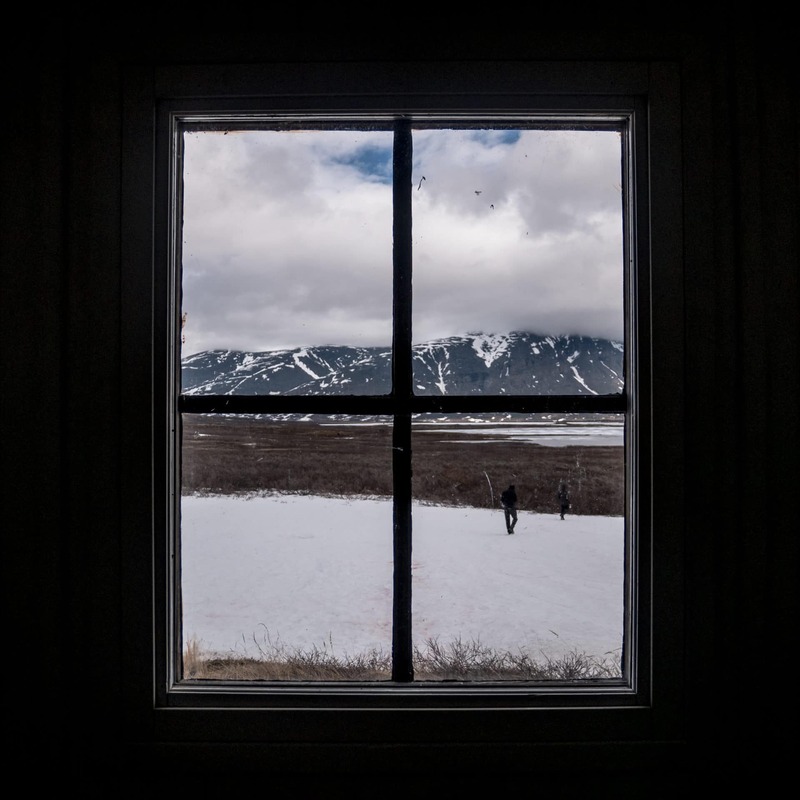 Yesterday they had to “rescue” people… not a good news… With all this infos we decide to begin in the Vistas valley tand to improvise depending on the snow… We’ll see. Here we are, ready to go, everything is set, it’s sunny,.. one last photo and GO ! 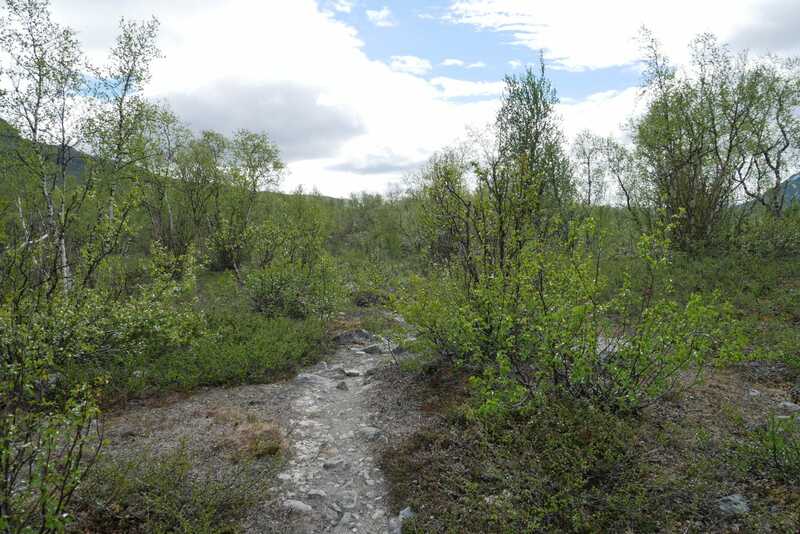 We start on the road for 2km then we turn left into the birch forest. We are directly attacked by the mosquitoes ! 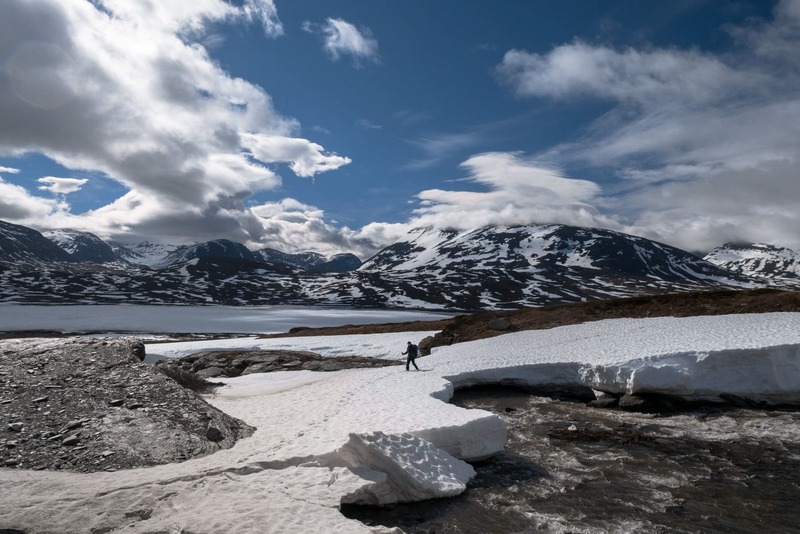 In summer, polar regions can be a real inferno because of the mosquitoes which are swarning in the swamps. We hoped that there would be few of them in June (which was true especially because of the late winter). There are few of them after mid august. The problem is that we made a mistake ! We turned left too soon so the path disappears after few hundred meters and now we walk either on thick forest or in swamps ! Ô happiness ! We don’t know if it is normal or not and or map is showing us that we should be in a right place… so we go on. It’s already late and we are tired of the journey so we start looking for a place to camp. After a bit of hesitation we find a nice place close to the river. It will be fine for the night. The tents are quickly set up even if the mosquitoes are trying to distract us. The mood is quickly better after we lit up a fire. Fast lunch and everyone is going to bed because we are tired… The place is nice on this evening with a beautiful sunlight over the valley. However, I am falling asleep a bit worried due to the snow, the swamps we had to cross and the ones ahead,… We will see tomorow but I hope it will be better… Anyway, I’m still happy to be there ! 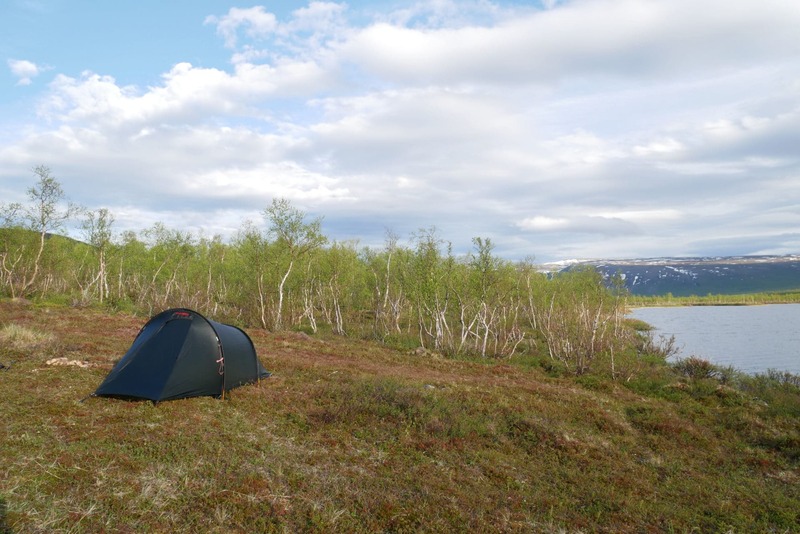 We had a good night sleep even with the midnight sun. We find the right way after this nice meeting. 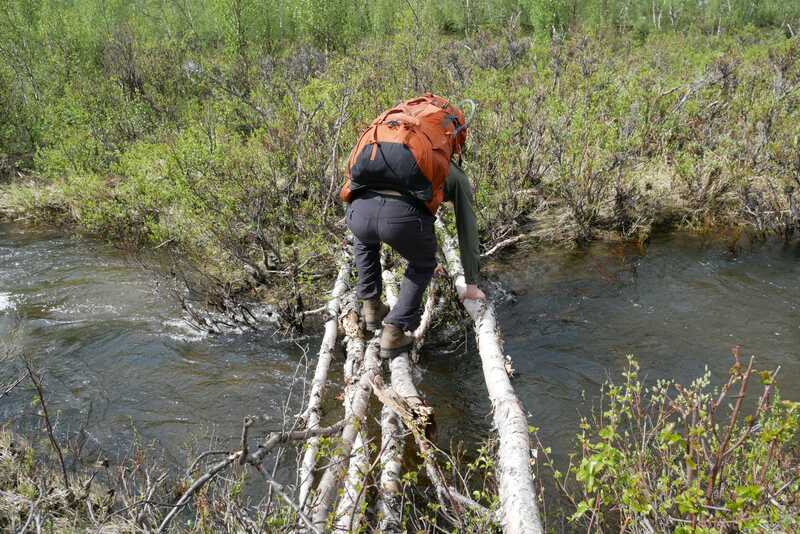 The crossing of the river is done on a makeshift bridge in trunks of birches. 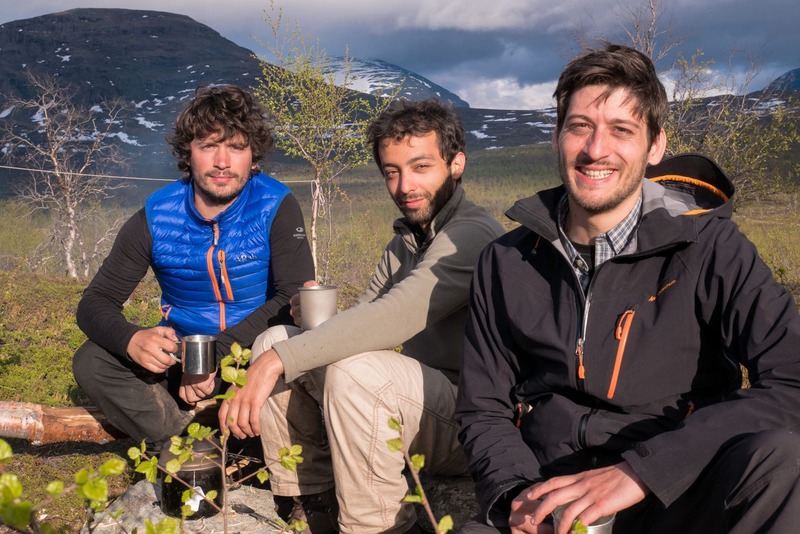 We then meet a group of four Russians who passed by the mountains a few days ago, good news! We can therefore pass despite the snow, the conditions are not so horrible as that. We continue the road at a good pace taking time to admire the landscapes. 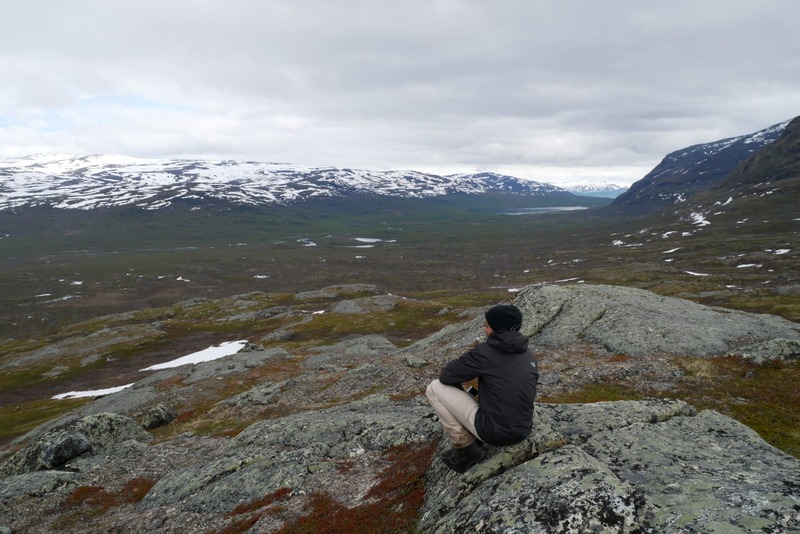 Behind us, Nikkaluokta seems already far away, the phone network has disappeared since this morning, we are now really in the Wild Lapland! The day is long, especially as we are not yet “warmed up” and that the bags are heavy in this trek start. 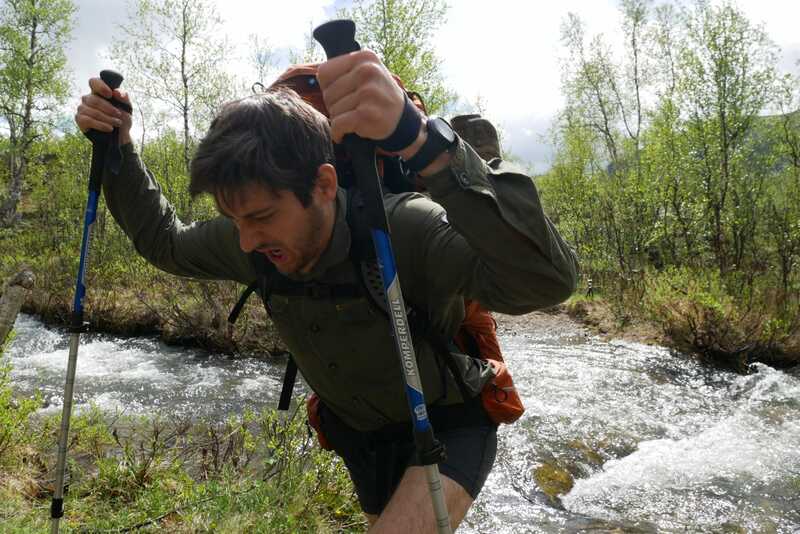 Quentin begins to feel pain on the iliac crest and suffers a little while walking, for my part I start to get a little fed up, it is soon 16km walking. Two guys we met earlier (with 10 people this day was the most populous of the trip) told us that there are some very nice camping spots next to a bridge. We decided to push another 2km. 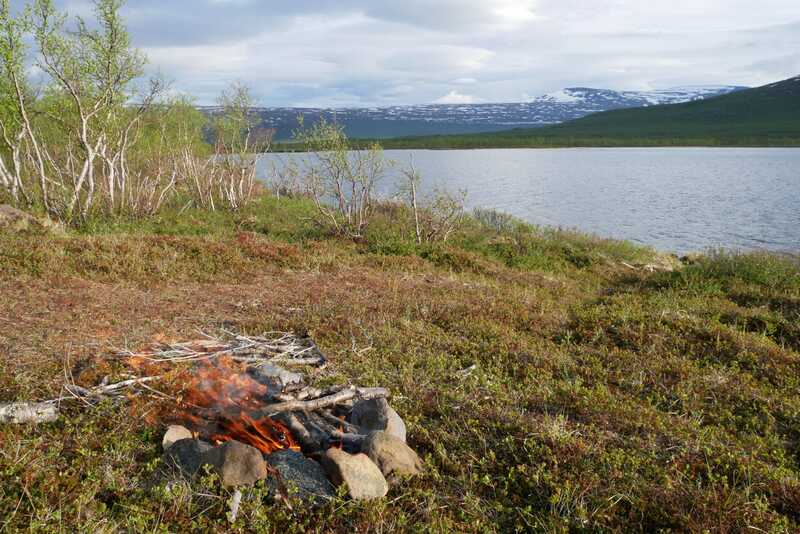 And indeed, we find a perfect location for the camp: flat grassy ground, river below 20m, corner for the campfire … Perfect! 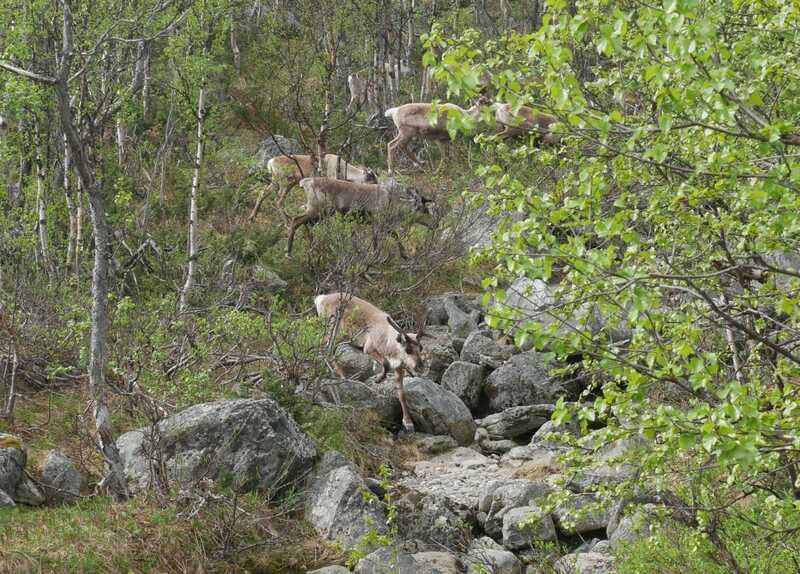 I spot a herd of reindeers in the forest a little further away! They have not seen us, so we approach discreetly to observe them. They obviously spot us before long and escape but we still have time for few photos. 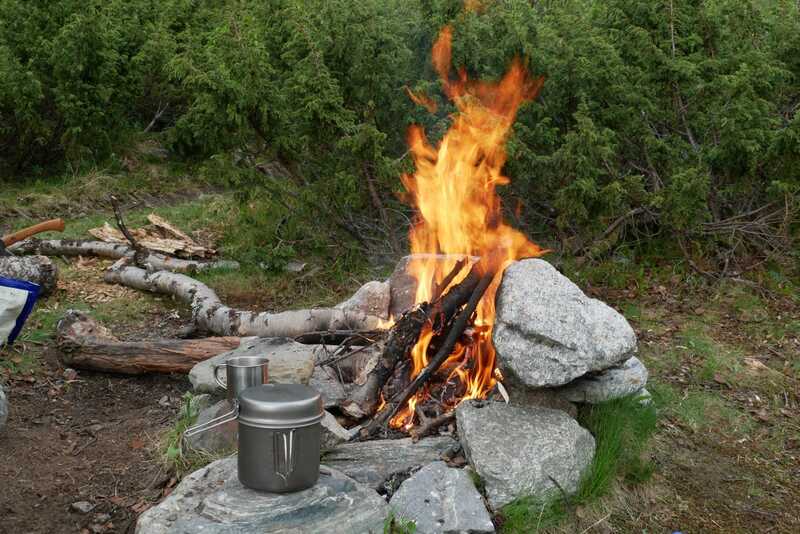 The camp will soon be set and the fire quickly lights up. It’s a fresh weather we have tonight. 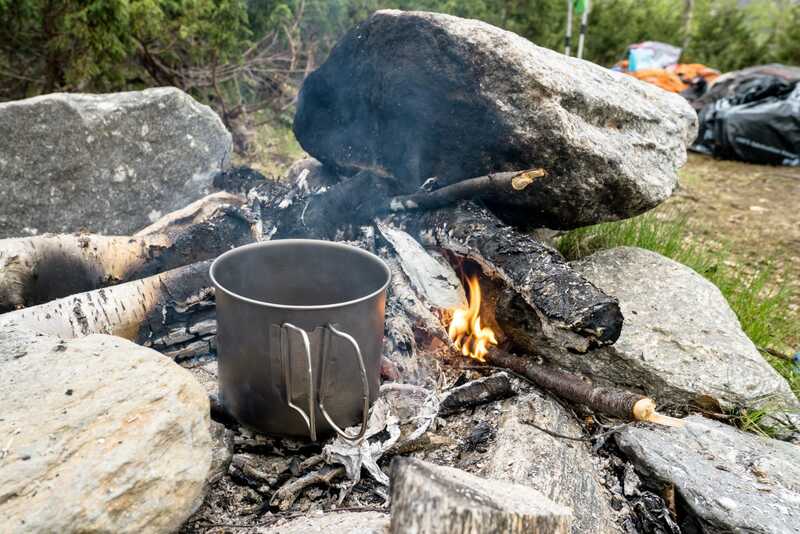 Everyone washes a little at the river (the water is always as cold) and we have a “good” meal based on dehydrated food, sausages and cheese by the fire. We are well that night, we feel free. We are living what we came for, we are lucky. Another good night even though the sound of the river was pretty present. We fold, we tidy up, we start. 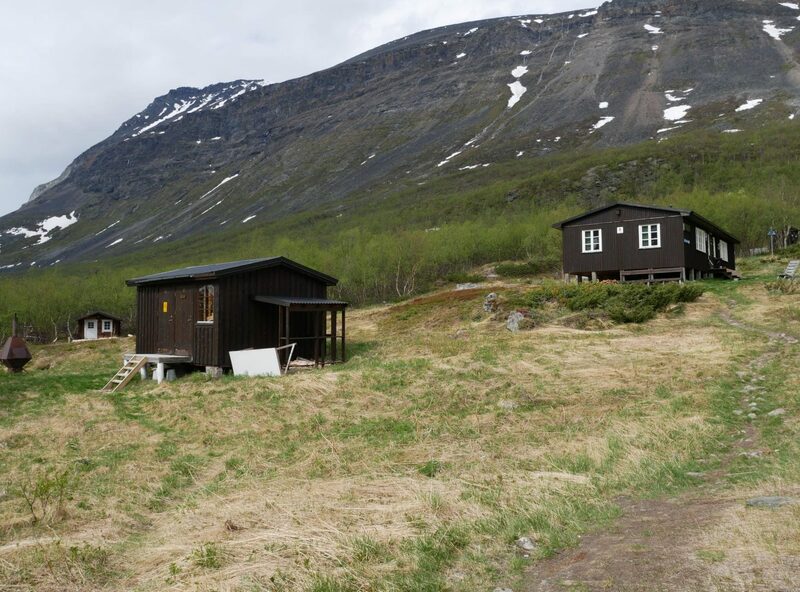 The program of the day is light: we walk to the cabin / refuge of Vistas 10km away. 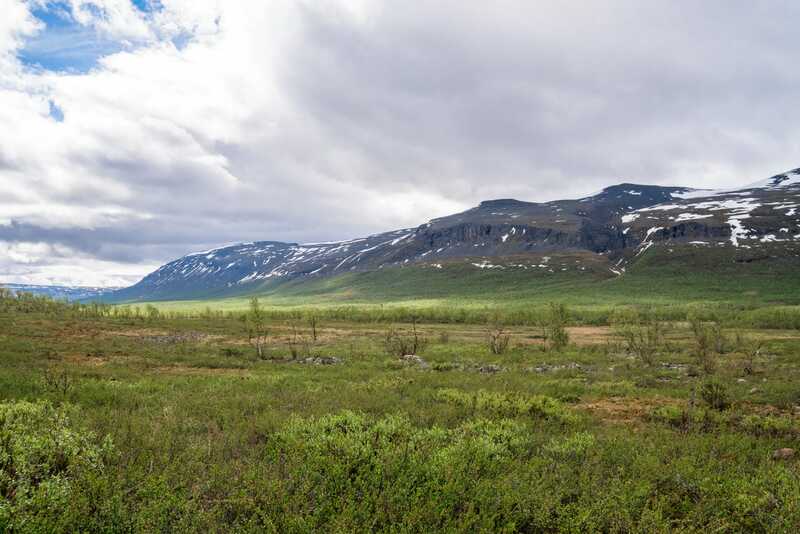 We are on our way back, still further into the wild Lapland. 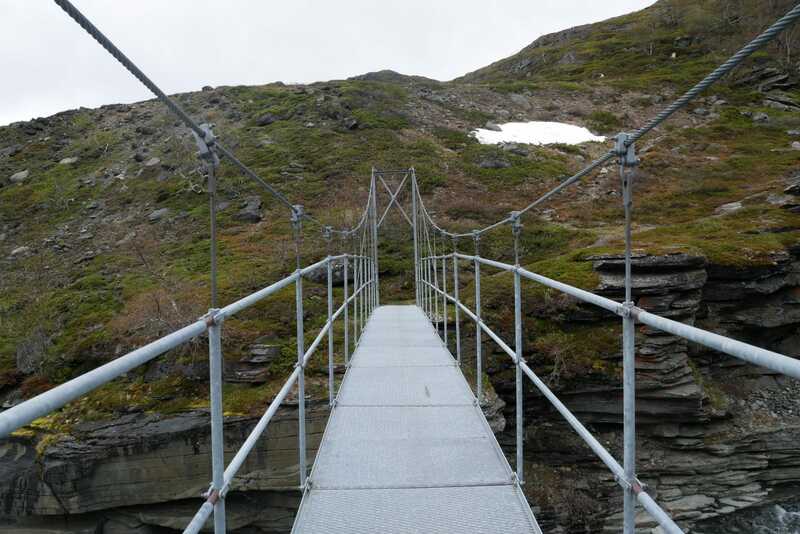 The beginning of the road takes us to a small bridge that crosses an impassable river otherwise, farther, again, small bridge that crosses a beautiful river and which offers a superb view on the valley downstream. The map shows the presence of a hut near the second bridge. We did not go inside but this one looks more than rundown. The path then leads to Vistasstugan. We arrive there 4 hours after the departure of the camp this morning (without hurry). The day of walking was short. Vistasstugan is normally guarded but the keeper will only arrive 2-3 days later according to what we were told in Alesjaure the next day. 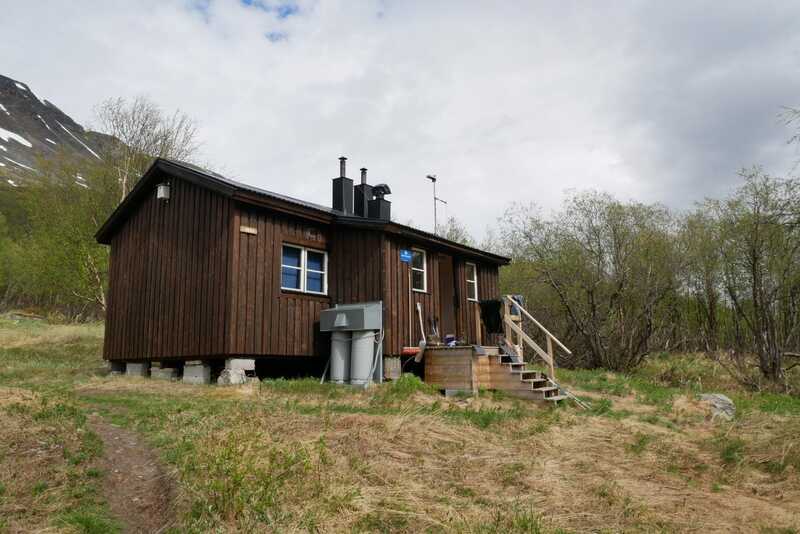 The facilities cover a fairly large area because there are several residential or technical buildings and even a sauna! 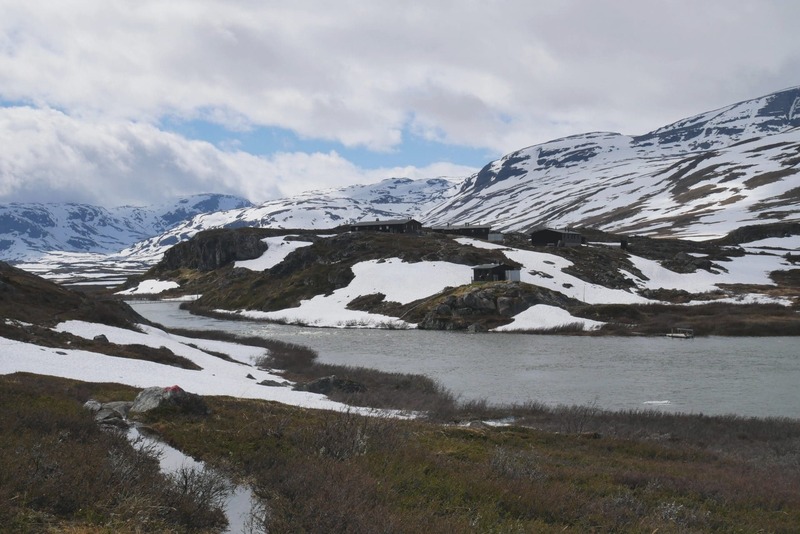 As far as we are concerned, we are heading towards the winter hut (the one near the bridge) which remains open annually and which in particular contains an emergency telephone. The hut is really nice, it’s even amazing how well it’s laid out, maintained and clean! 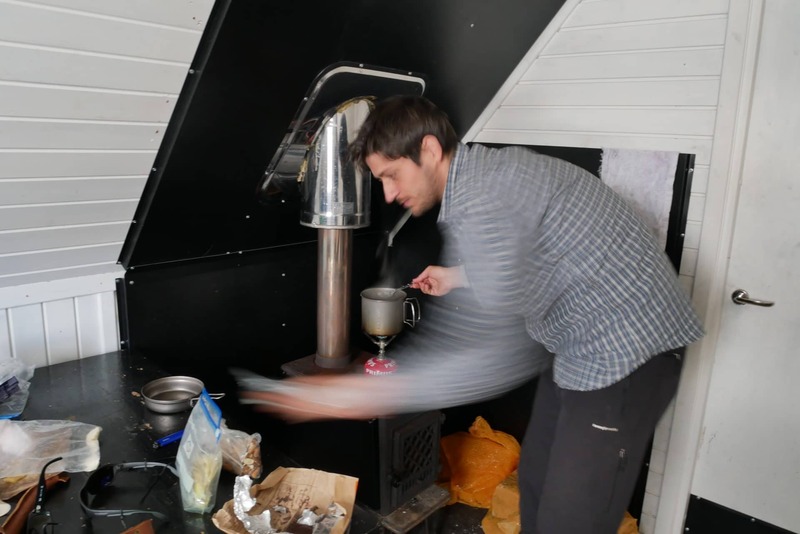 The atmosphere inside is very cozy, there are four beds (relatively comfortable), a table, a stove that heats very well, gas and a small gas cooker (great luxury) and quite a lot of kitchen equipment. We will believe ourselves at home! 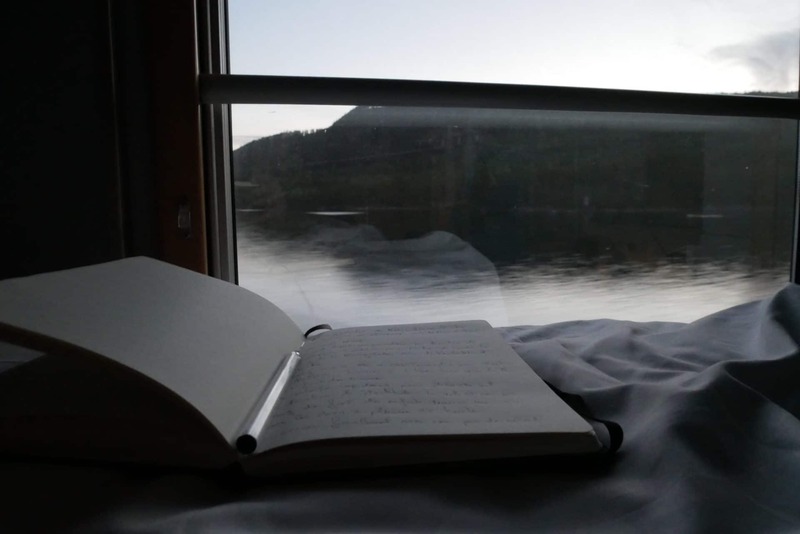 We settle for the rest of the day and the night, three days already that we left and it would be stupid not to take advantage of this small cabin, especially since, according to what we know, the next days will be hard! 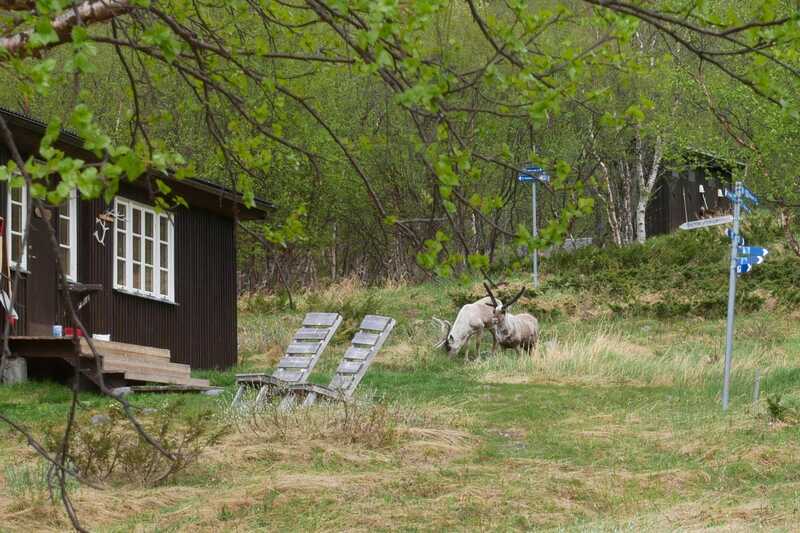 Scarcely settled, we are welcomed by reindeers passing in the middle of the cabins. The afternoon will start with a hearty meal followed by alternating siesta, “shower” at the river, playing cards (a lot) and just enjoy the moment. 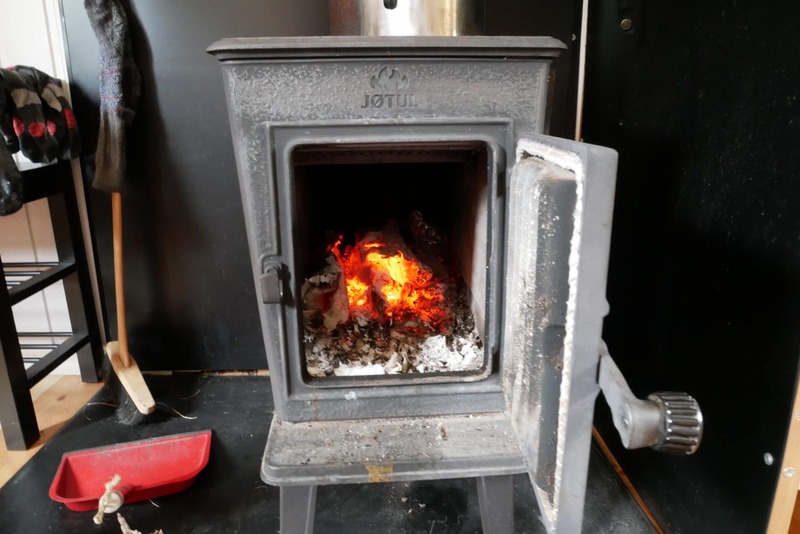 We will also throw a fire in the stove to warm up and dry the clothes, the latter heats very well, so it is very (very) hot quickly in the cabin but it’s not bad. 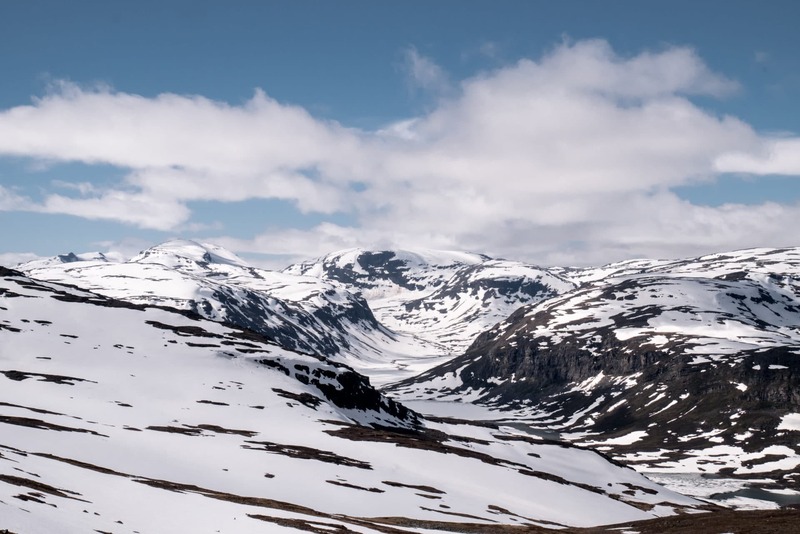 Vistasstugan is a beautiful place, it offers a nice view of the mountains around and on the valley. There is also the beginning of the path for Nallostugan. 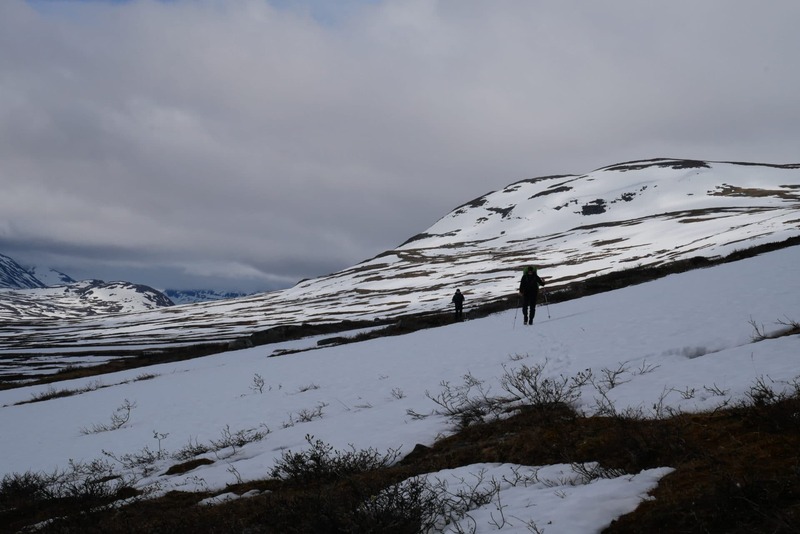 We will be joined in the early evening by two Us girls who come from Abisko, which is good news because it makes two groups that come from this direction, so it will be achievable. 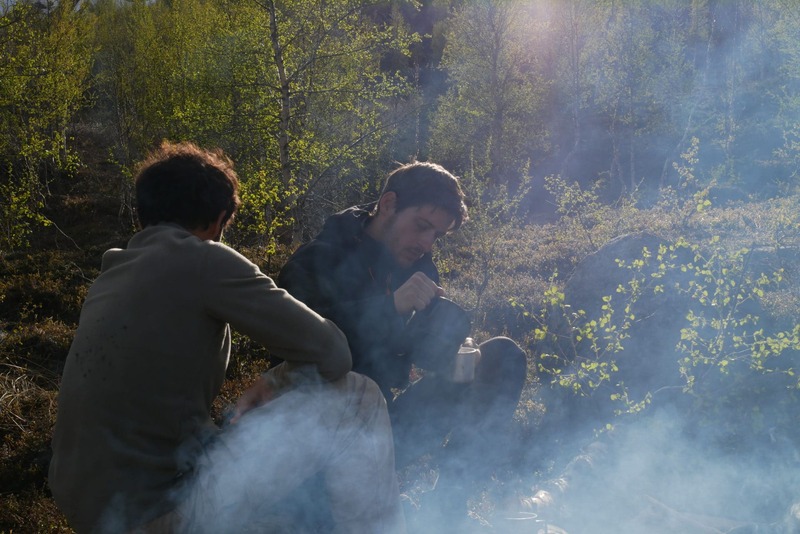 As we took three beds out of the four of the cabin they decide to settle the tent a little further, we will nevertheless share the meal and heat of the stove. We will be in our bed soon because tomorrow we have a long road to Alesjaure. 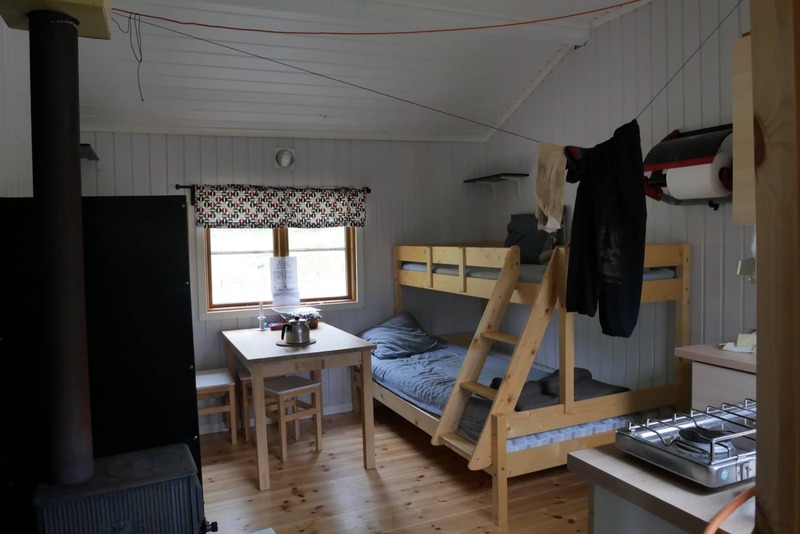 Although the winter cabin is unguarded there is a small “fee” that must be paid (250SEK / night / person). You can pay the amount by bank transfer or at the STF office in Abisko (and maybe in Nikkaluokta but I have a doubt about it). Destination Alesjaure after tidy up and cleaning of the hut. 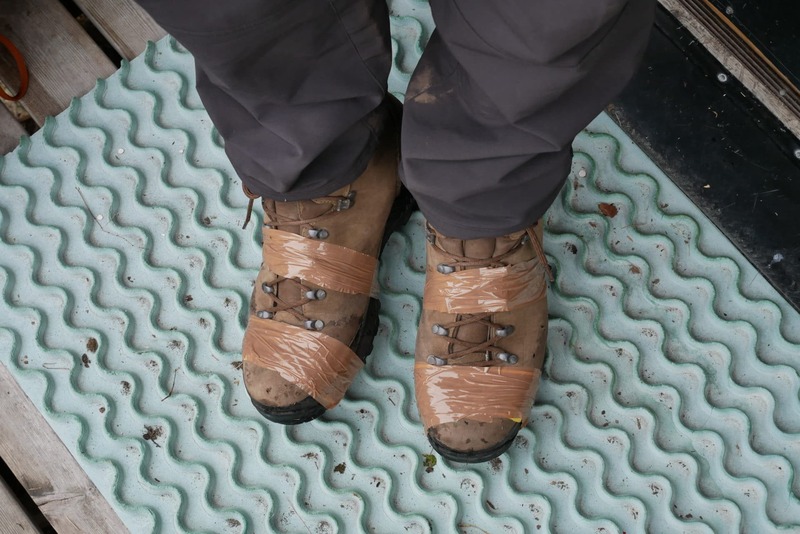 We are rested, the tape is put on the shoes of Matthew, the bags done … Let’s go for 19km! Today, we leave the valley of Vistas after three days to walk in it. 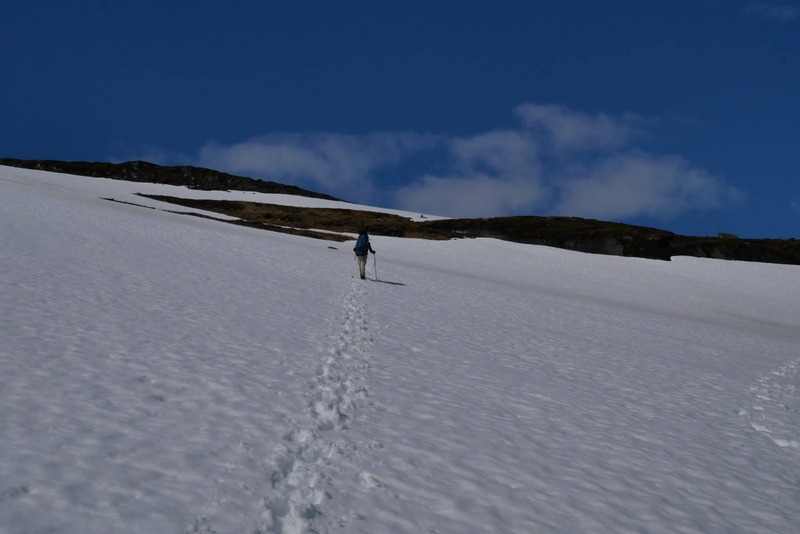 We will begin to take a little altitude to arrive finally a small pass that will allow us to “descend” on Alesjaure. 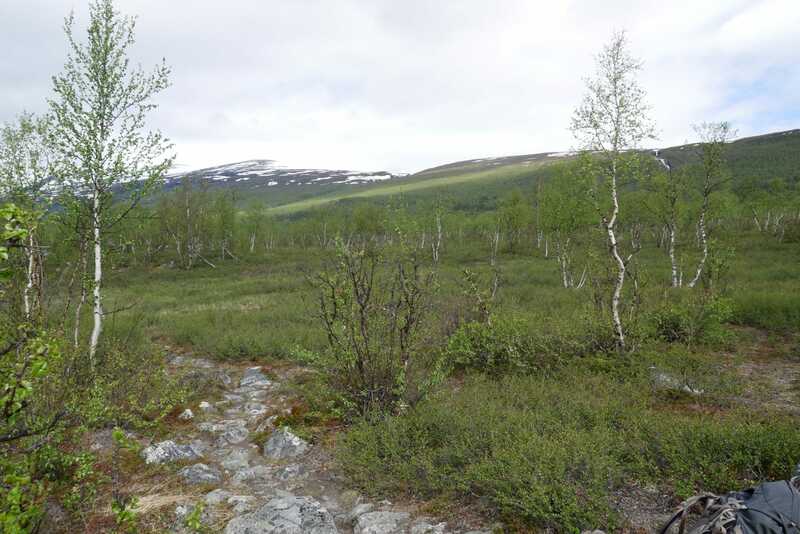 The vegetation changes rapidly, the trees become more and more rare and stunted, the tundra takes the place. The bottom of the valley is beautiful and wild. 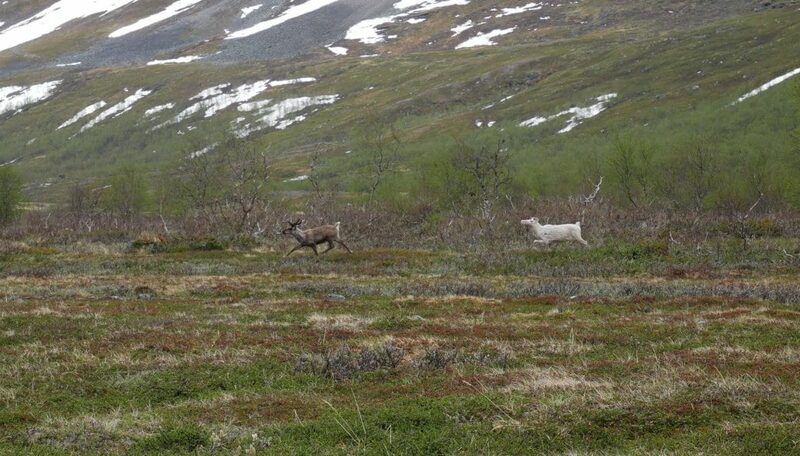 We will have the chance to pass not far from a reindeer couple shortly after departure. 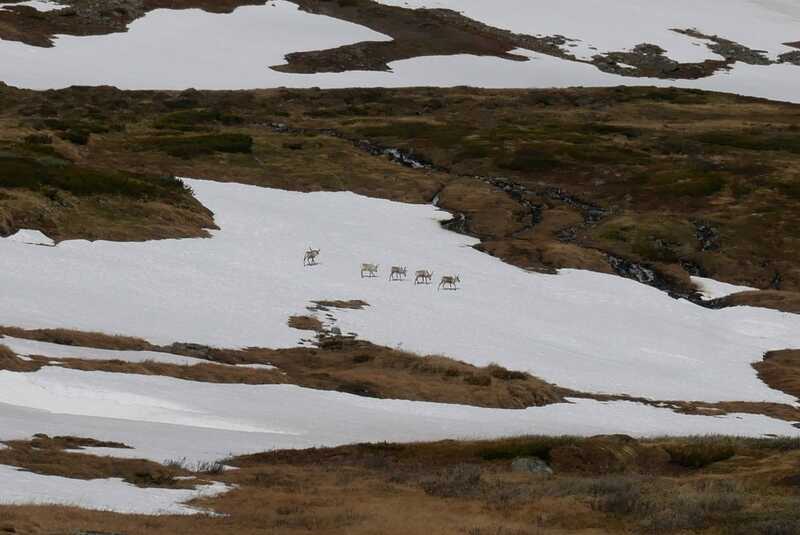 The reindeer are here accustomed to humain since they belong to the Sami people and are parked several times a year to be counted or marked. The path is good and relatively dry on this portion. We’re moving forward quickly. 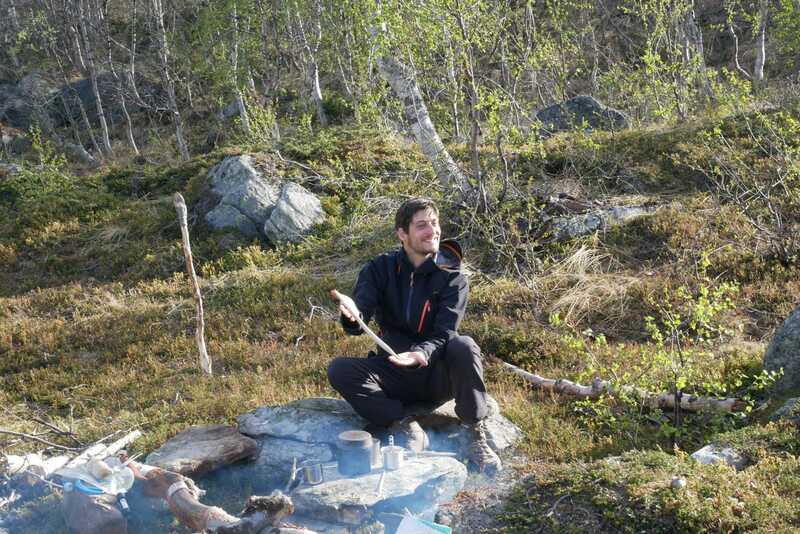 We will have lunch break in front of a Renvaktarstuga hut(private hut owned by Sami people). Further on we cross the Moarhmmàjhoka on another small bridge, all on the same kind, simple but efficient. Just behind, we start the climb on the pass. Last look at the valley of Vistas who will have kept his promises in terms of landscapes and isolation. 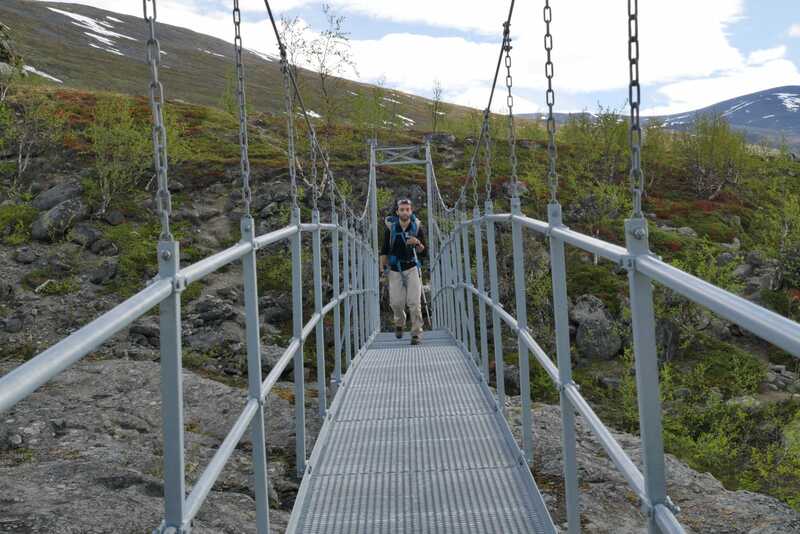 We then cross three groups, some Swiss, Estonians and Germans who all come from Abisko. They give us all the same version of the way, ie achievable but extremely wet and snow is often above the knees between Alesjaure and Abiskojaure … Despite the fight that seems to be waiting for us, we will make it which is better than than turn around (the US girls of the previous day still told us that a group of 9 people had called the helicopter to Alesjaure to go back…). The path passes here on a kind of plateau. We’re starting to get our first snow. This one is rather good and is none of a problem to us. 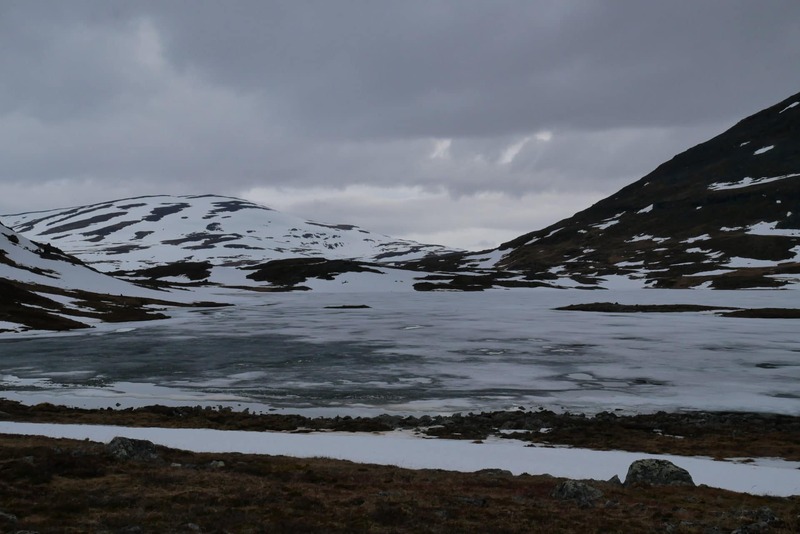 We feel that we are in altitude because the trees are almost absent and the lakes still partially frozen! 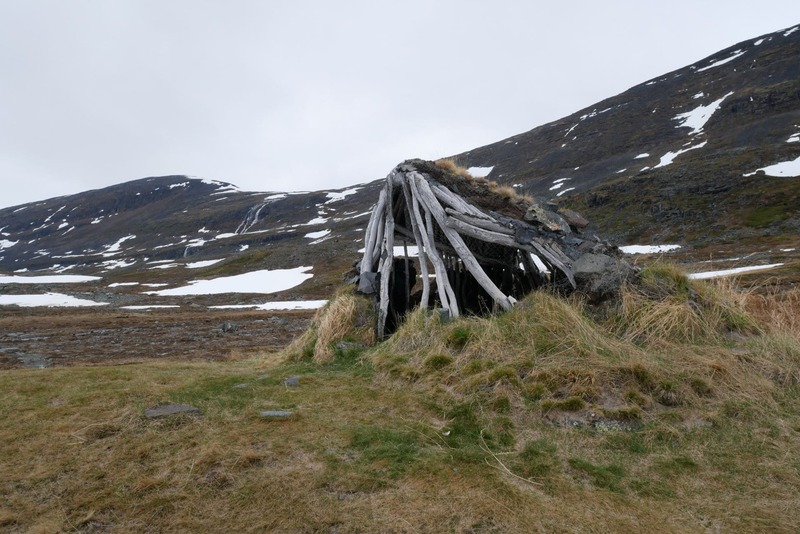 The hut of Tjatjajaurekåtan is a ruin, it can offer a relative shelter to the wind for a break. 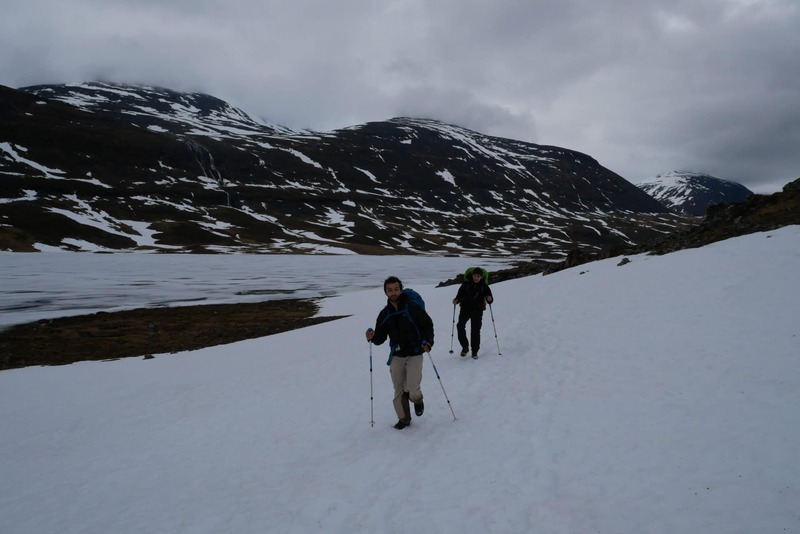 We quickly begin the “descent” on Alesjaure. 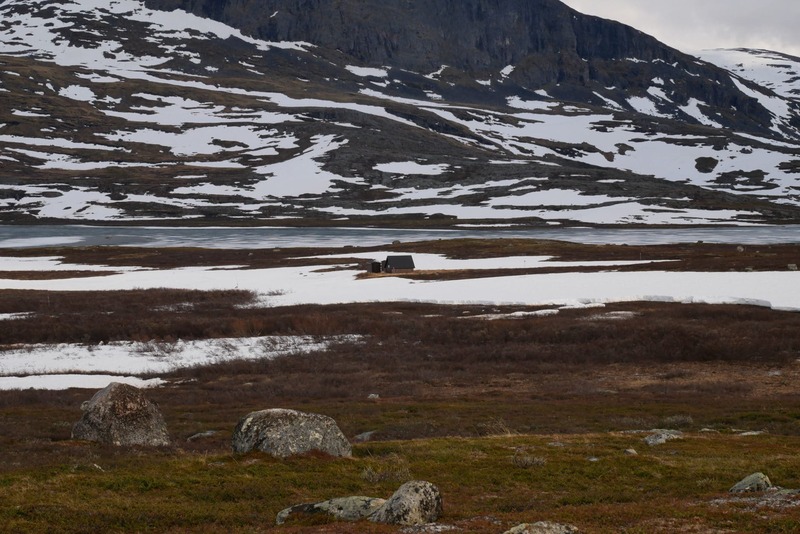 During this one we pass not far from Alisjàrvi a Sami camp still unoccupied because it is a little early in the season. 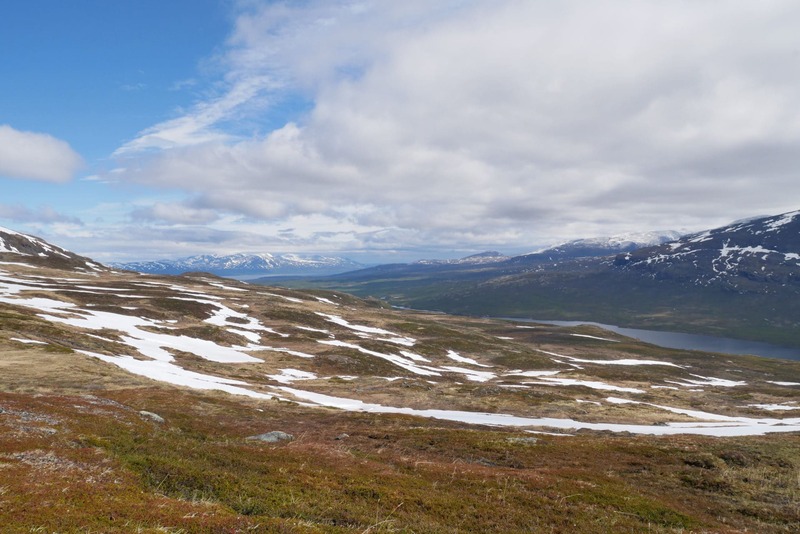 The view of the lake makes it clear that there is a lot of snow on this part of the Kungsleden. As it begins to be late in the afternoon the snow has softened, so we pass a little through but nothing terrible for now. 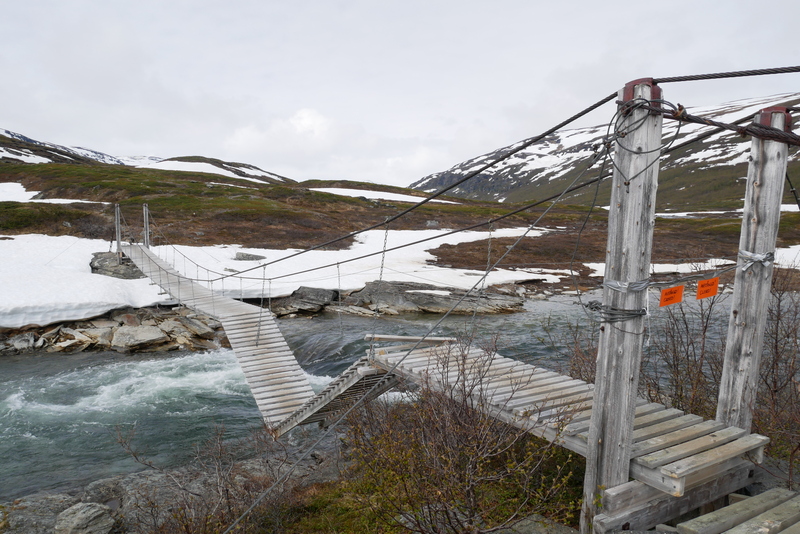 A few river crossings and finally we arrive at Alesjaure. Alesjaure is a big installation, there are quite a few cabins. 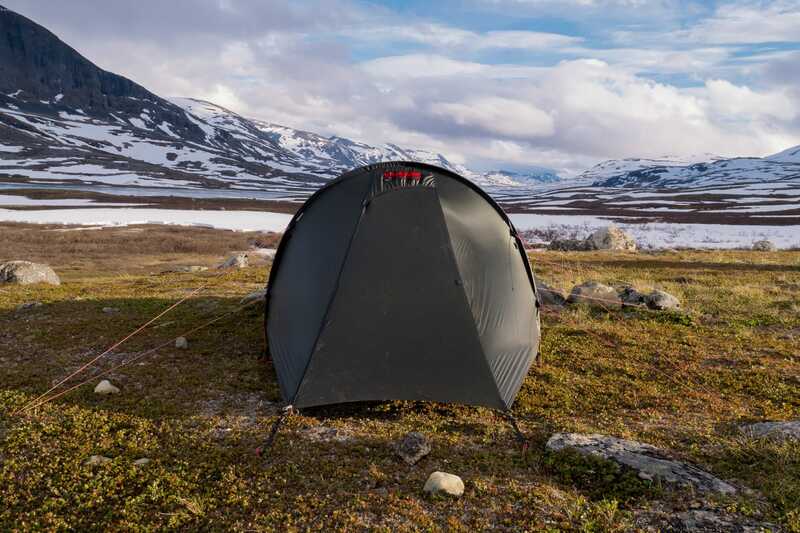 I do not know how many people can be welcomed here but we think there must be quite a few people on the Kungsleden in the high season. 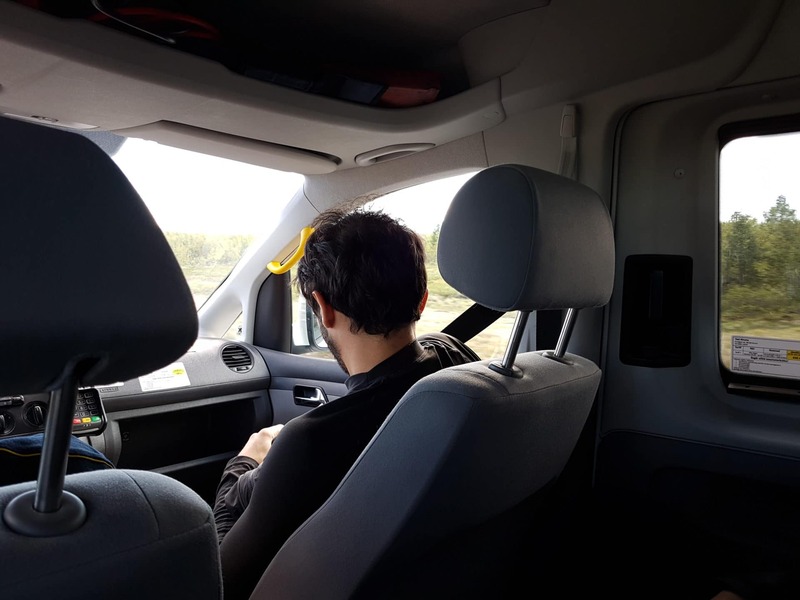 We will make a stop at the main cabin, time to chat a little with the friendly guardians about the field conditions and to give them of feedback about the Vistas side. We will not stay here, however, we prefer to set the camp a little further. We go on 300 meters further and find a beautiful location that offers a breathtaking view of the valley. The vegetation has changed a lot, here only shrubs and grass are found. 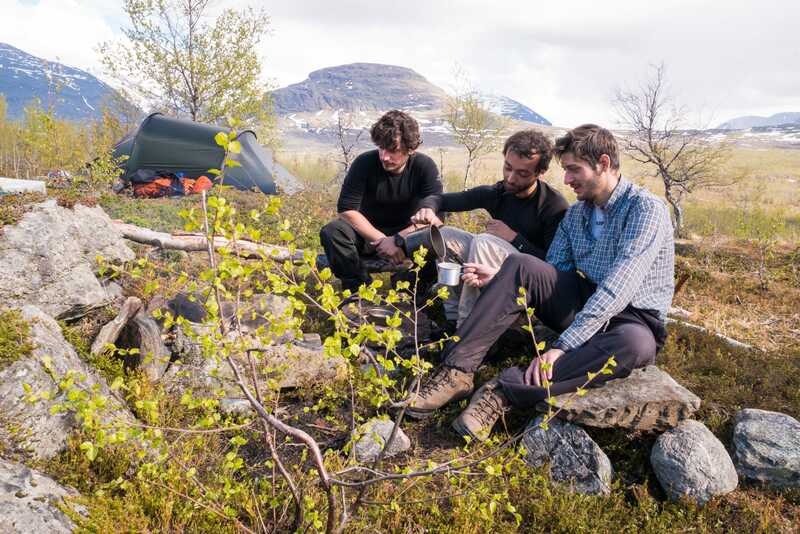 The camp is quickly installed, we relax because we walked a fairly long distance. 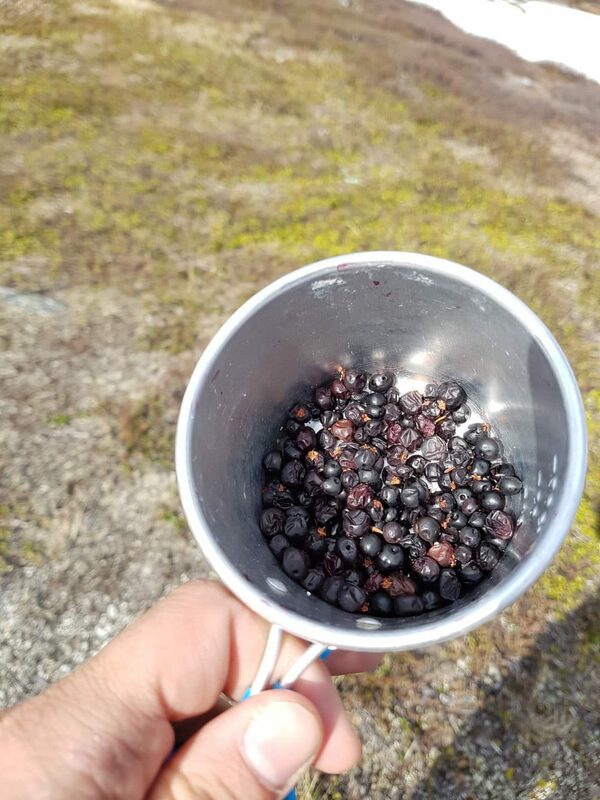 Matthieu goes in search of berries and brings back a few black berries (it’s a shame because there are still few berries given that the winter was late). The end of the evening will be cool because the wind blows strong and it descends directly from the mountains. Tomorrow awaits us a difficult day, so we eat a lot and we go to bed early. Day 5 : a hard day (or not) ! One day more in deep Swedish Lapland and not least because today we attack the part so dreaded since the start. 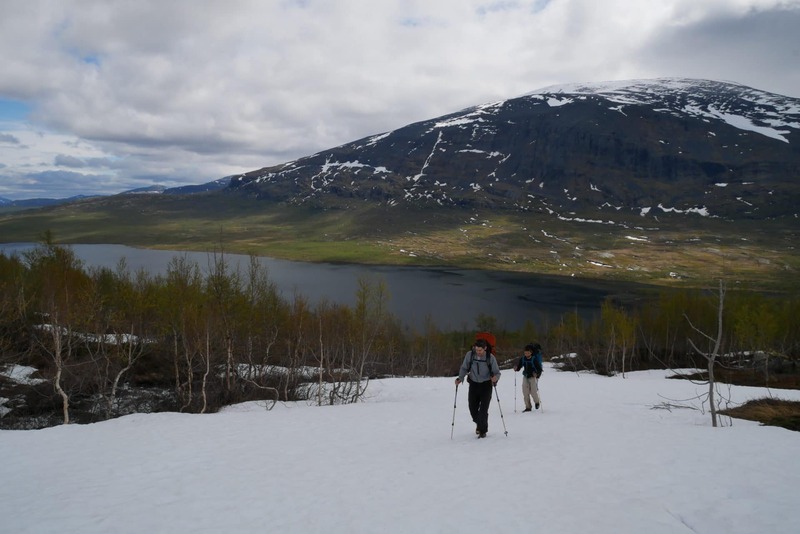 Our strategy for the day is established: the majority of the groups met followed the “true” path of the Kungsleden along the lake but the “U” shape of the valley makes the water run and stagnates in this zone which makes the snow bad so one ends up soaking wet in the snow / swamp mix. 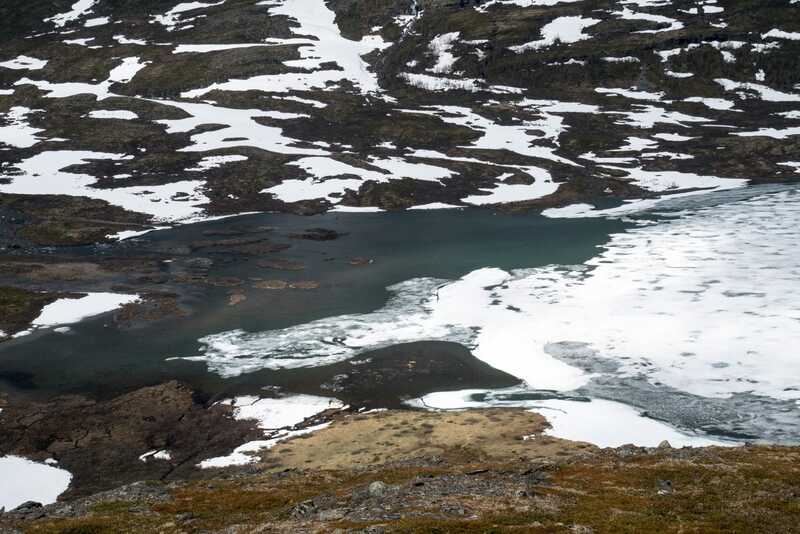 So we chose to go higher up to 800-850m in order to be in an area where the water does not stagnate and to take advantage of the altitude to have a snow a little colder. 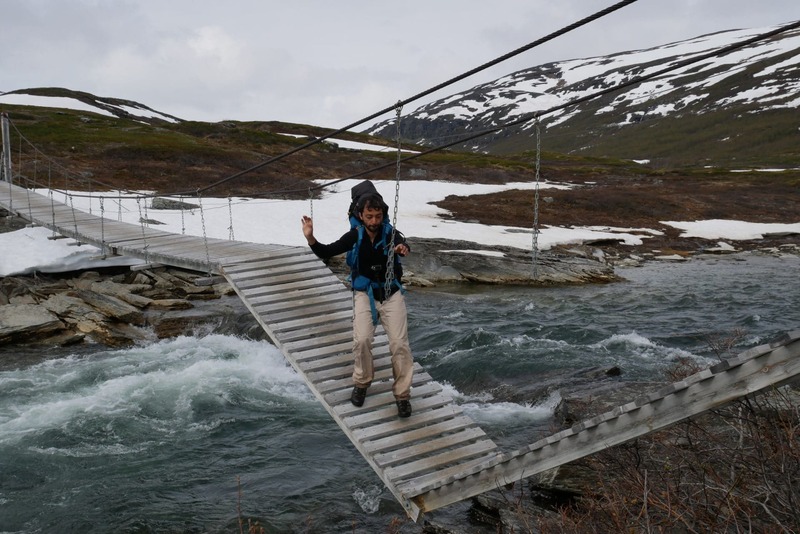 According to the feedbacks we had the main difficulty is concentrated on the crossing of an important river 2km after Alesjaure and whose snow bridges in the lower part are broken, we hope to find good ones on our way, upper. We leave, after five days each now has its reflexes, its rituals, we are now 100% in the trek. 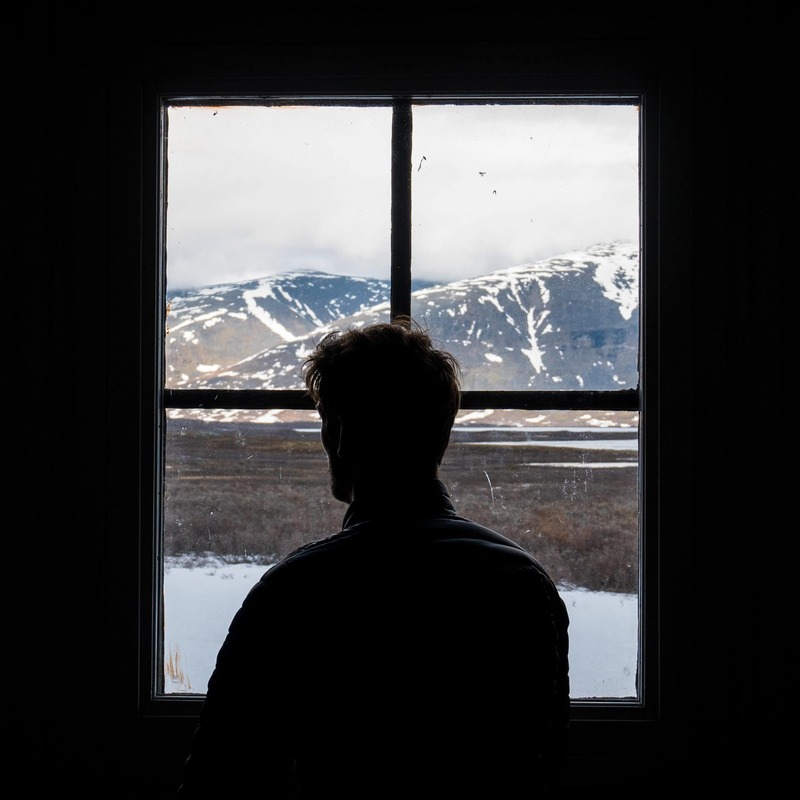 We must admit that the absence of a network is positive for this because we are really disconnected from the outside world. 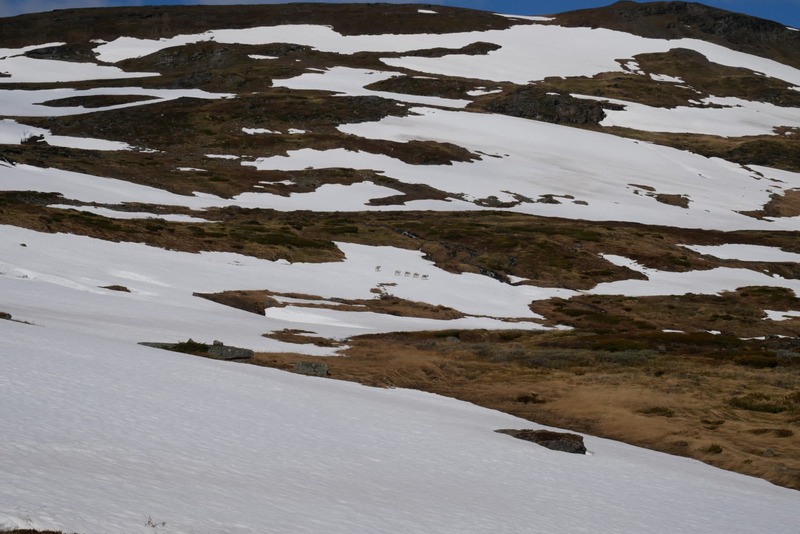 The beginning of the way is good and we take advantage of the cool morning to progress rapidly on the hard snow. We stick a little a few times but nothing dramatic. The famous river is approaching but for the moment no problem and to top it all it is beautiful! After 45min we arrive to the river, we quickly understand why it can cause problems: it is relatively wide and the flow is impressive. 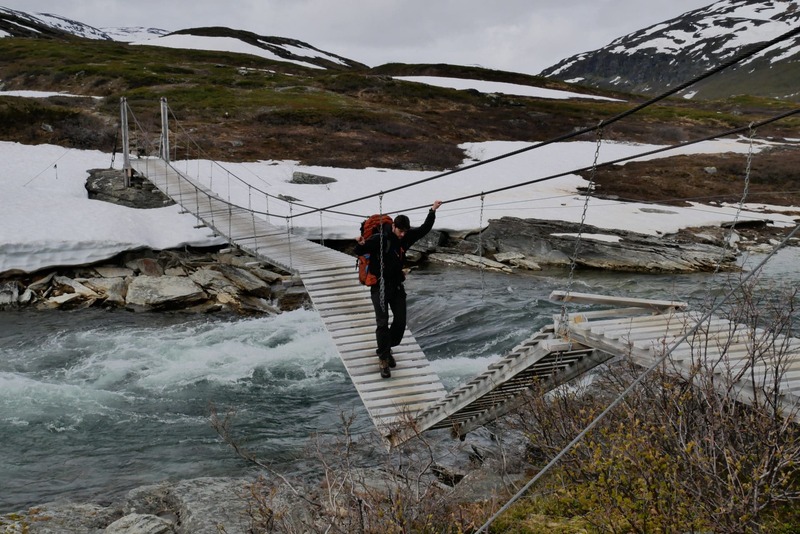 Luckily we fall directly on a snow bridge that seems solid. For safety, we go through each turn; and everything goes fine! It is a moment of joy because our apprehensions of the previous days are flying, the weather is beautiful and the scenery in this place is magnificent! We take the time to savor it. We then stay on the heights because it is clear that the bottom of valley is gorged with water. We walk relatively fast, there is nobody, it’s nice and the sun does not spoil anything at all. The view of the valley, upstream as well as downstream, is magnificent. 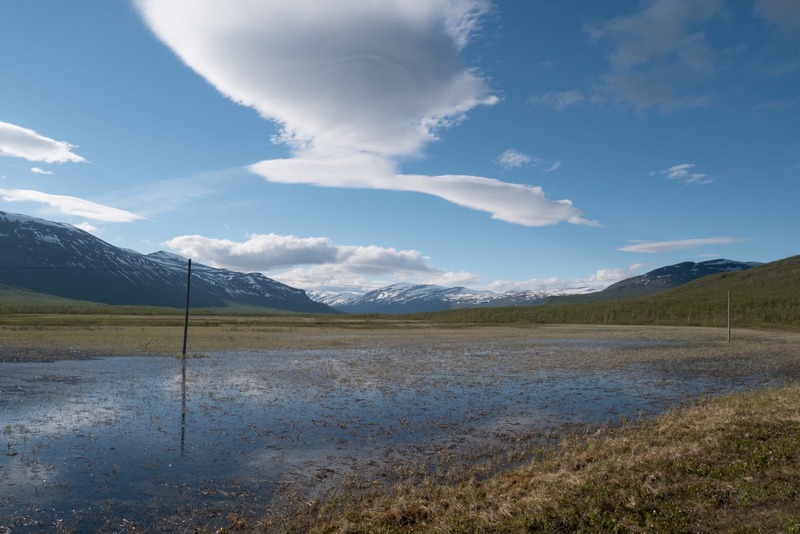 We meet the Kungsleden at the level of a “rengärde”, a large circular enclosure to park the reindeers during the annual counts. The path is much more muddy but fortunately the sections arranged make it possible not to be too wet (even if in the end the water finds its way into the socks). 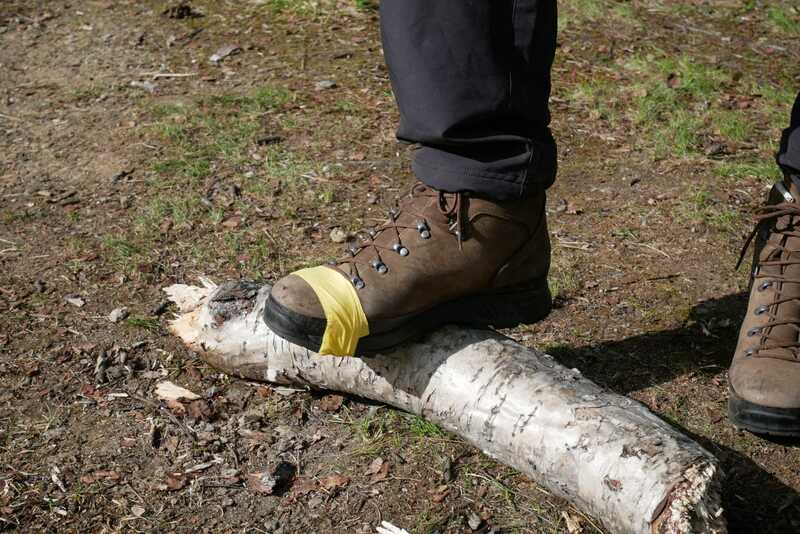 The use of gaiters and really waterproof footwear is recommended for the whole trek to limit the penetration of water. We have progressed much faster than expected but it is useless to run because we still have quite a few days ahead and so we have time to go slow. 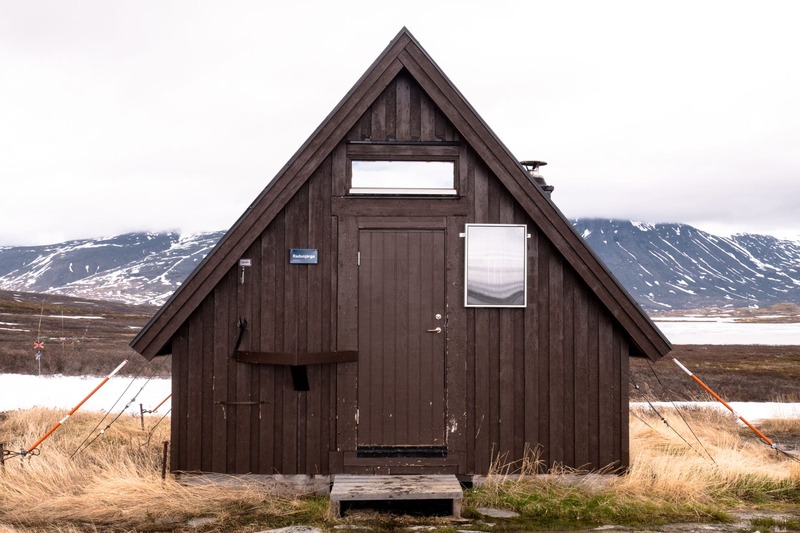 We decide to spend the afternoon in the small cabin of Radunjarga, it is a simple shelter a little away from the Kungsleden. It is composed of a lock (with shovels and brooms) and a large room with wooden benches, table and stove. 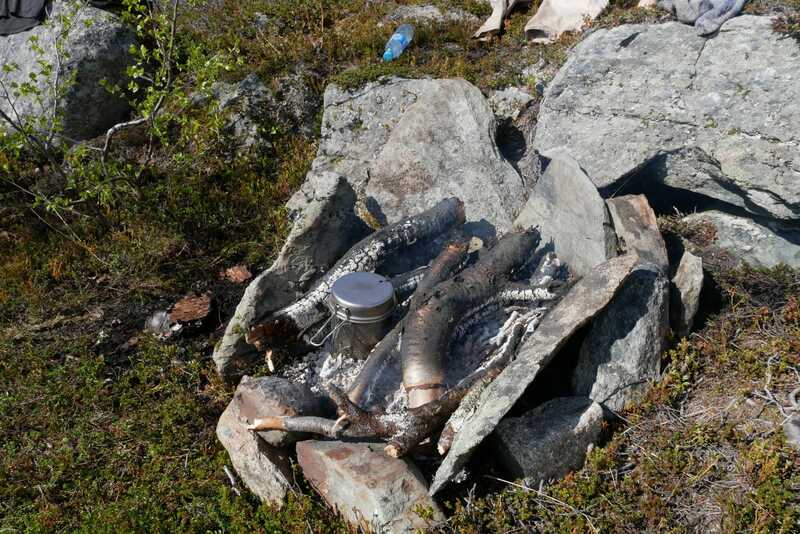 The use of firewood is reserved for emergencies and there are no trees in the area, so there will be no fire today. 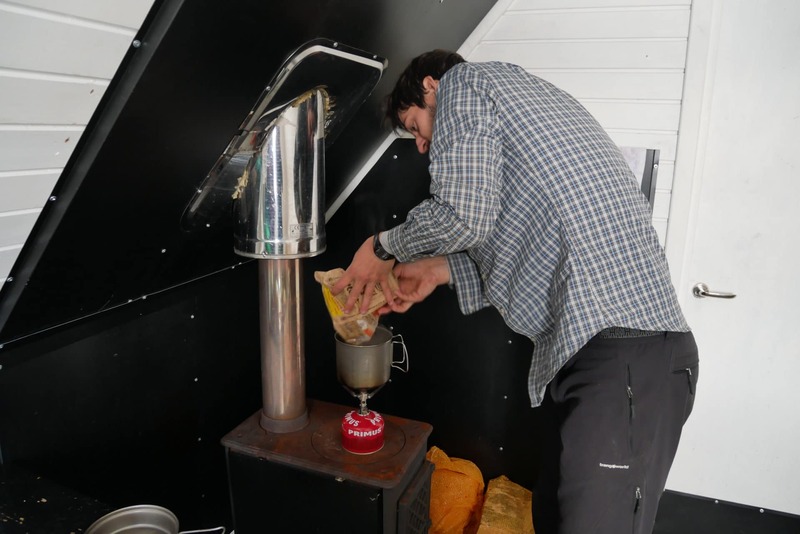 The afternoon will start with a good lunch and even some homemade hot chocolate made by Matthieu with love. We will then spend our time between resting, water chores and card games. 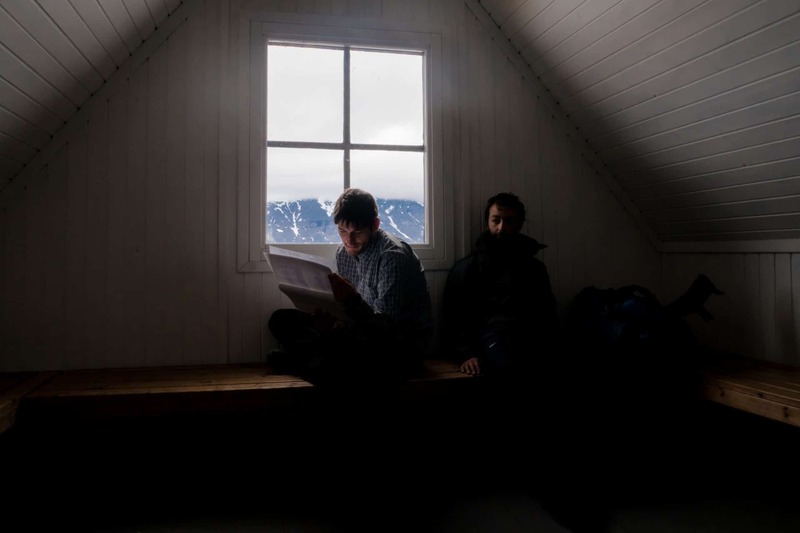 This moment in the cabin will have been a small pause in the trek, the comfort there was minimum but just as it needed to be. We chose not to sleep in the cabin in order to be quiet if people arrive late. 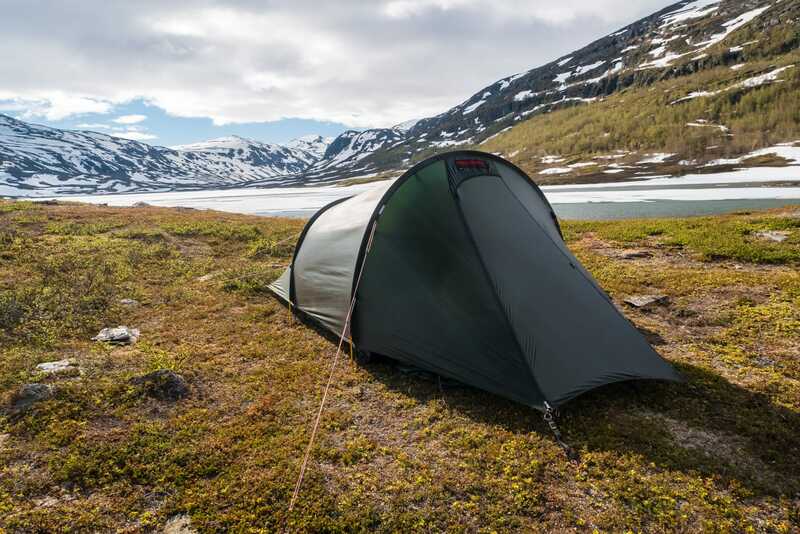 The camp will be set up a little further on the heights to enjoy a dry location. The landscape and the light are superb. I feel relieved and serene at the end of the evening because I know we will be able to join Abikso; Even the shoes of Matthew and their soles appear to want to hold. It was not hot that night but we still slept well. 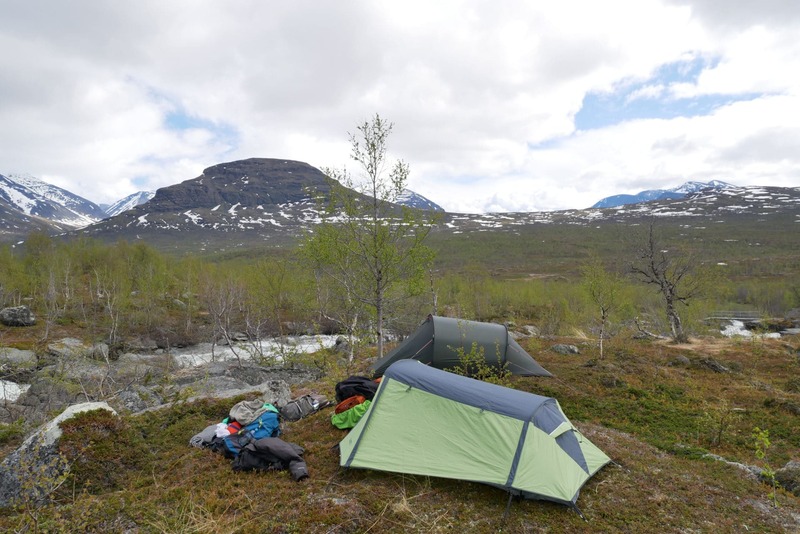 We are back on the Kungsleden. There is a lot of snow but we are still progressing quite quickly. 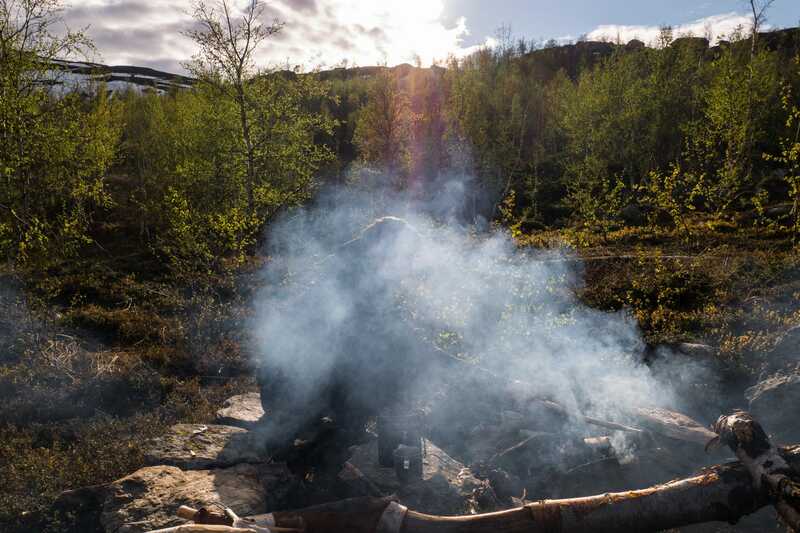 We are on the sixth day and we still have three days left before returning to Kiruna. 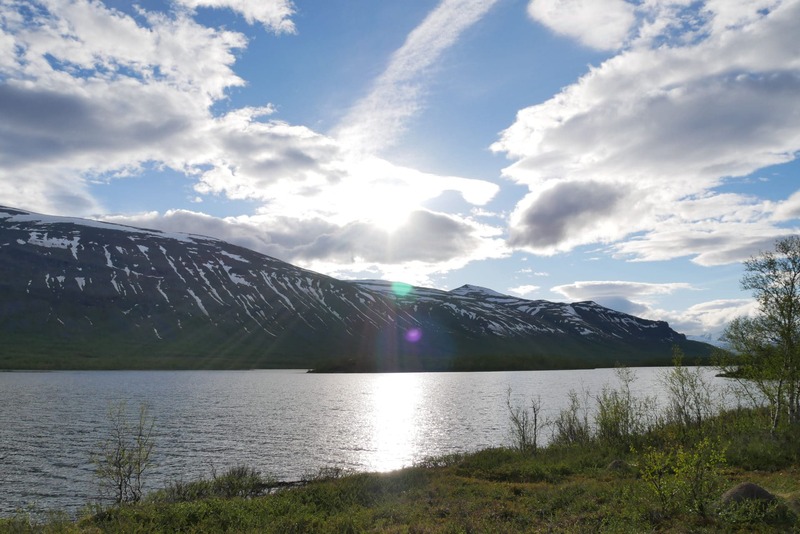 We are only two days away from Abisko. 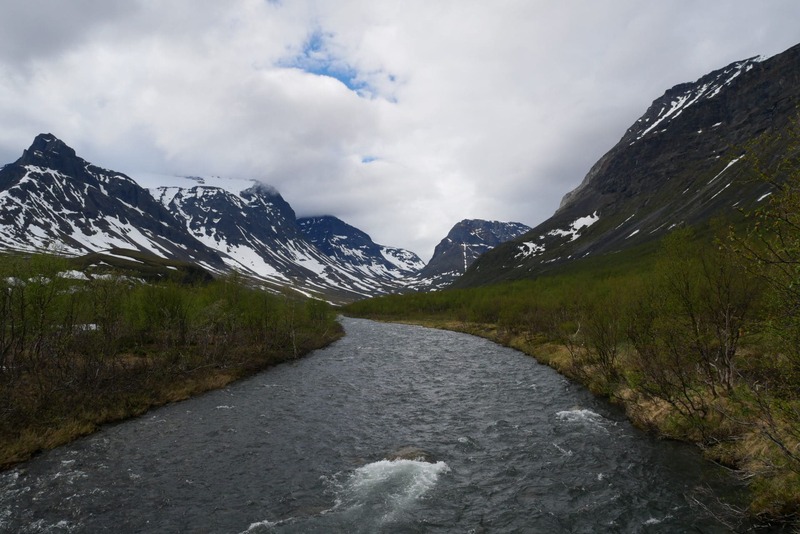 So we decided to change the plans a little bit: we are going to change the valley for the Kamajakka river because we are starting to meet more and more people here and we want to be more isolated. We also decided to stay two days at the same place to enjoy the nature, the quiet. 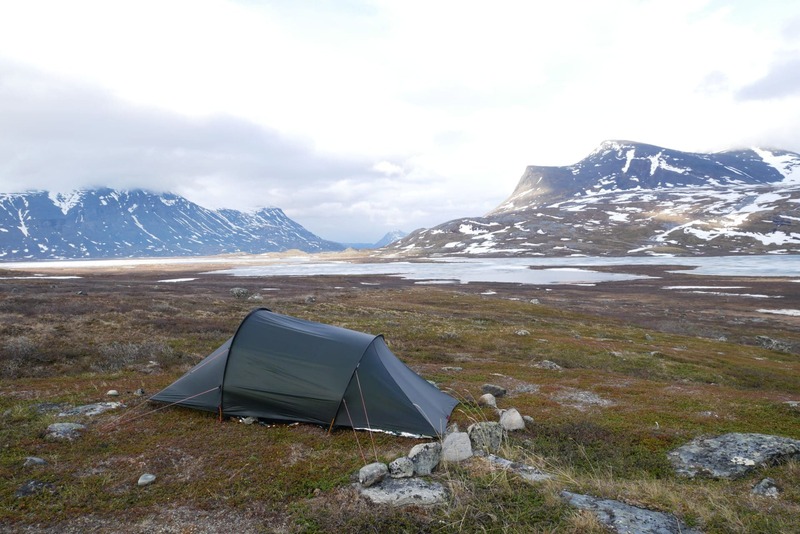 We will then branch off from the Kungsleden to Sami camp (a few hundred meters after the reindeer barrier). The path is then a bit muddy but it’s pretty. At 800m altitude, we climb a small hill to admire the valley below. The landscape is wonderful. 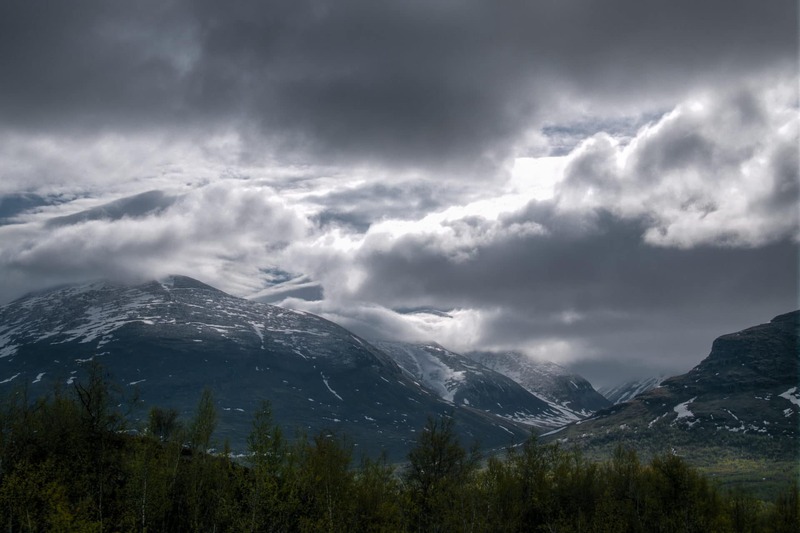 The vision is going for miles on a succession of snow-capped peaks and lakes further down the valley. 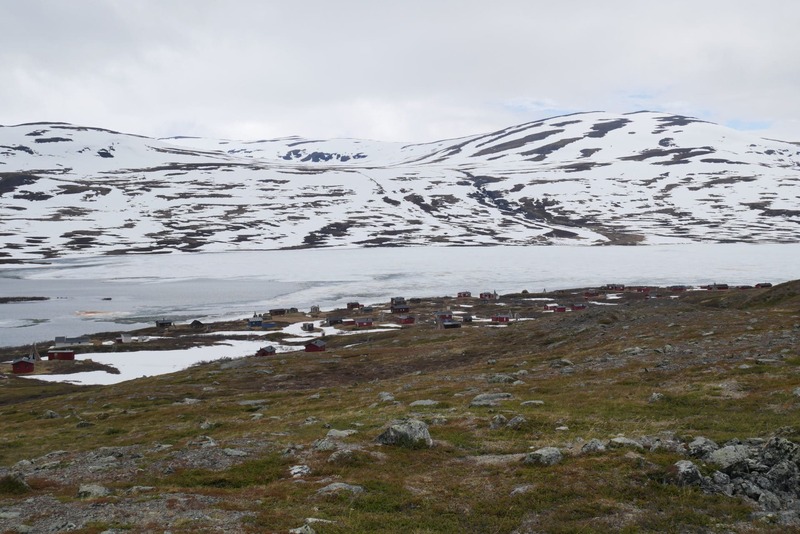 We can see the Sami camp of Rovvidievva in front of us. We settle down to snack while admiring Lapland. We begin the descent. The road is good, there must not be many people who passed here this year because there is no footsteps. 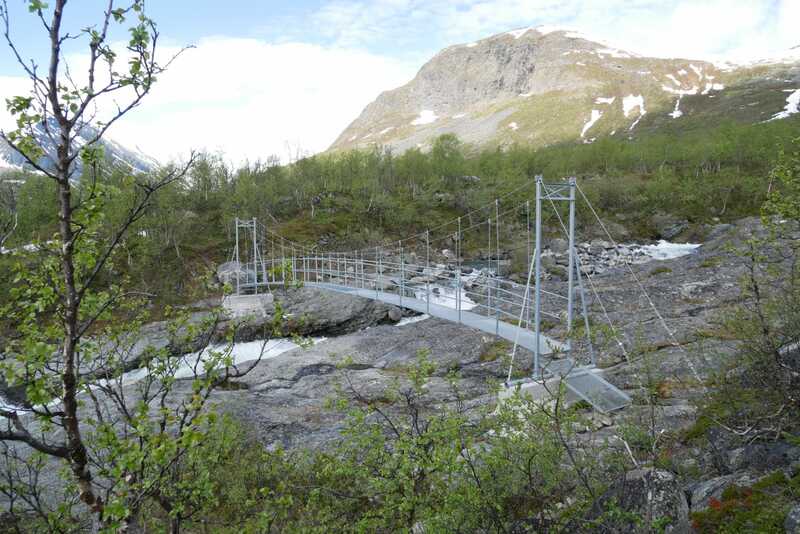 We quickly arrive at the small bridge that spans the river Kamajakka whose flow and power are impressive. On the other hand, Quentin realizes that he lost his camera a little earlier, so he goes back to look for it and, fortunately, finds it quickly. 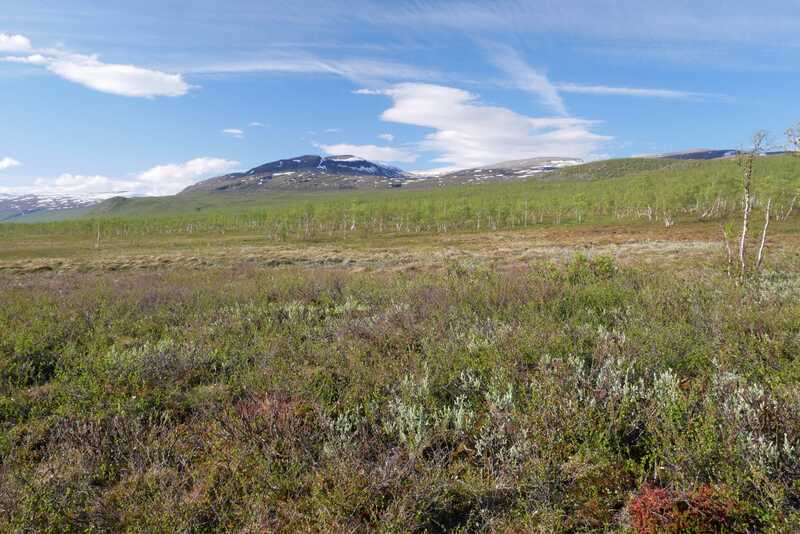 The Sami camp is not inhabited at present, so we pass quickly and continue north. The ground is particularly soggy, I hope we will find a nice place to set the camp. 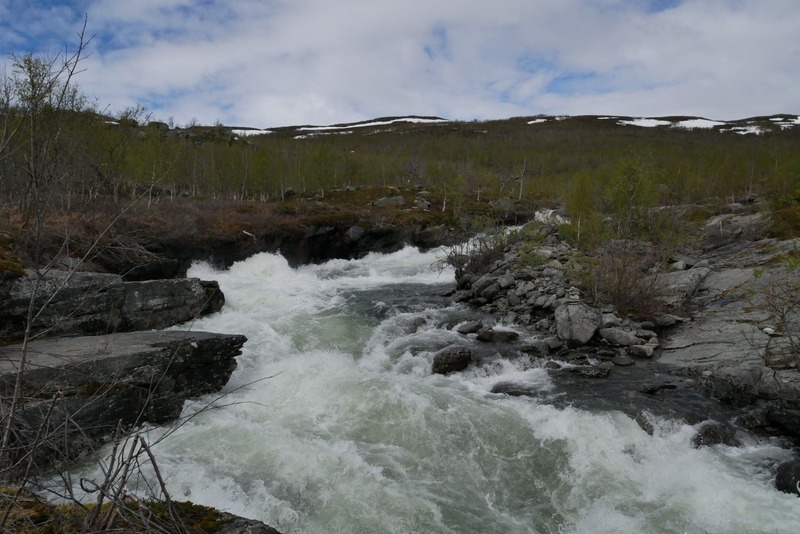 We arrive towards the Hoiganjohka river after 2km. We only saw one interesting camp place for now. 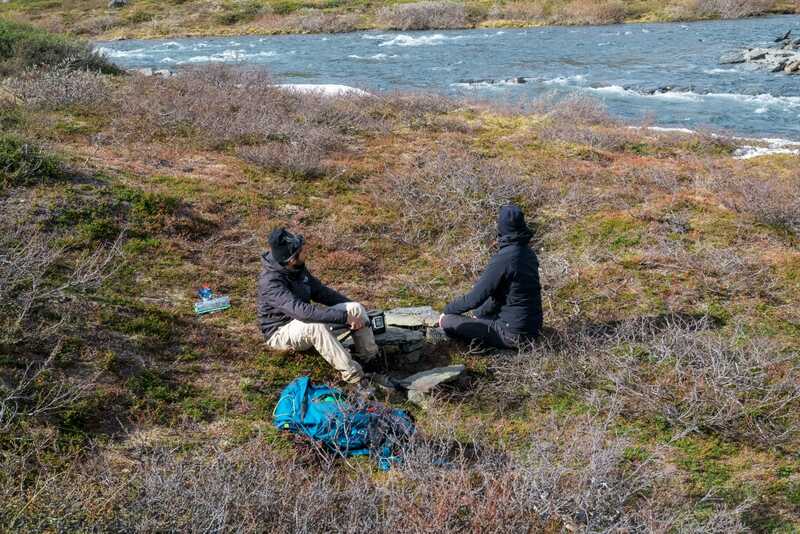 We leave the bags near the small bridge and we go in scouting in the area to find a good spot. After some hesitation we find the perfect spot! Flat ground, superb view, river at 20m … We are even welcomed by a great sun just after setting the camp. We settle for two days in our little camp. The rest of the day starts by eating a good lunch by the fireplace that we just launched. 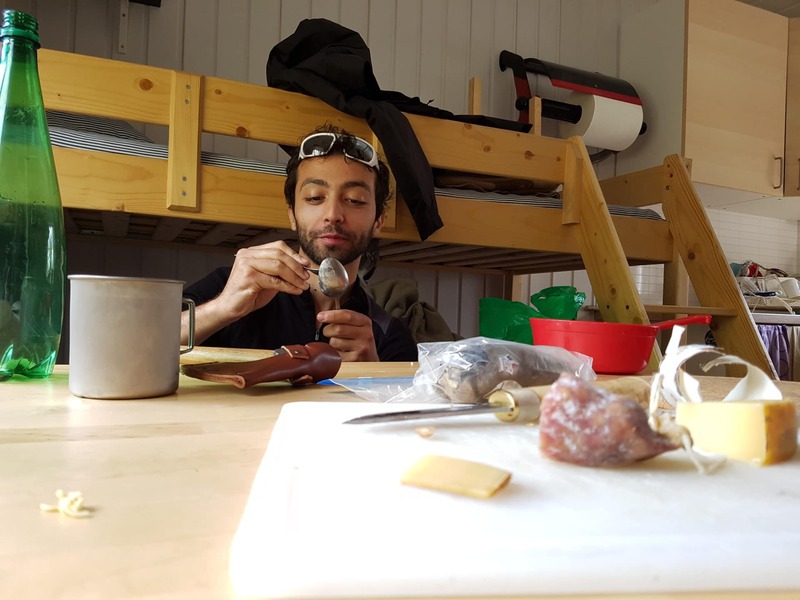 We will then share our time between farniente and workshop wood carving especially for Quentin and Matthieu. The light at the end of the evening is beautiful, we take full advantage of the moment. 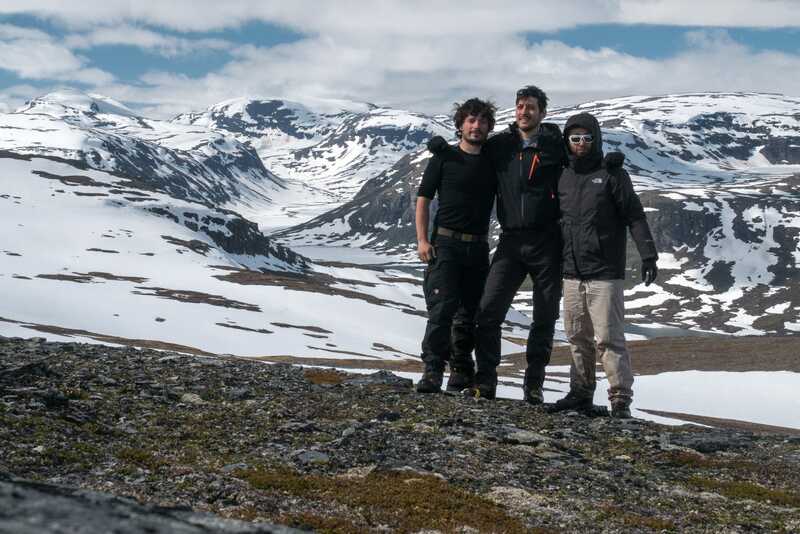 We have not crossed anyone since we forked out of the Kungsleden, we feel at the end of the world, isolated, we are well … We really feel fullness in this kind of moment, we came for it , we are overwhelmed. We will not lie down too late that night because the cold catches us even if the sun does not set. We will see absolutely nobody that day, it’s great … We are lucky to be here in Lapland and to be able to fully experience our adventure. Cool night as evidenced by the hat of frost on the surrounding mountains. The path is good and well marked towards the hut, with the loss of altitude, we find forests composed of large trees that contrast with the puny birches of the previous days. 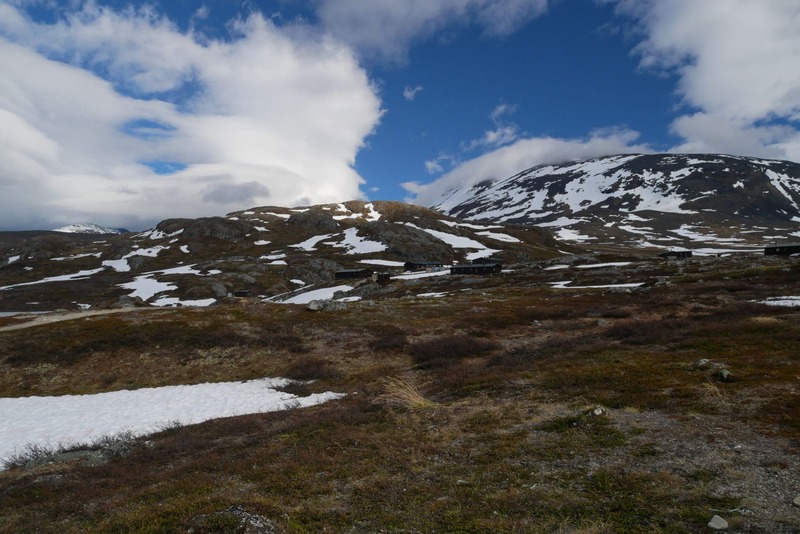 We will soon arrive at Absikojaure which is a big hut installation. The guards will tell us that they can accommodate up to 60 people per night. We meet them by the way taking breakfast and they will invite us to settle with them so that one exchanges on the conditions of ground. 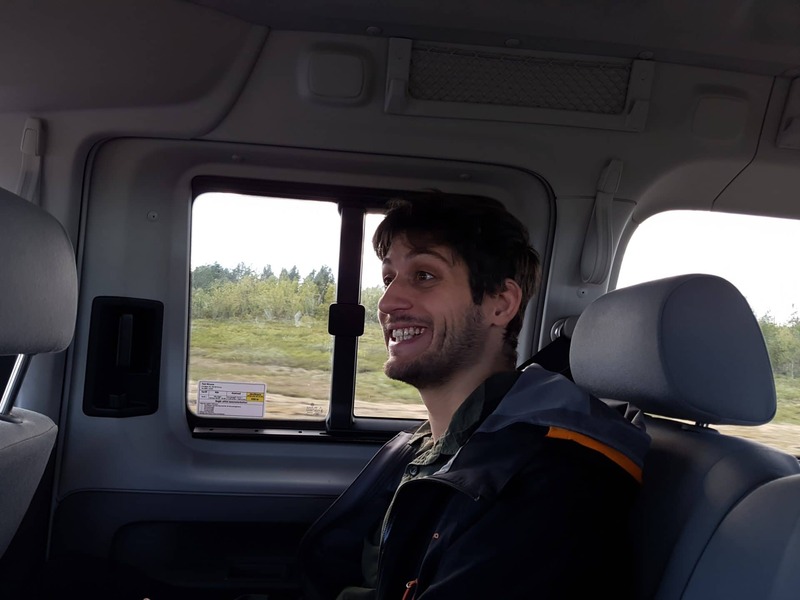 I am surprised because I do not have the impression that the cabins discuss a lot between them to get informations of the conditions on the ground, so the guards are very interested in the return that can be made to them. One of the managers tells us about a valley a little further north in which few people go. 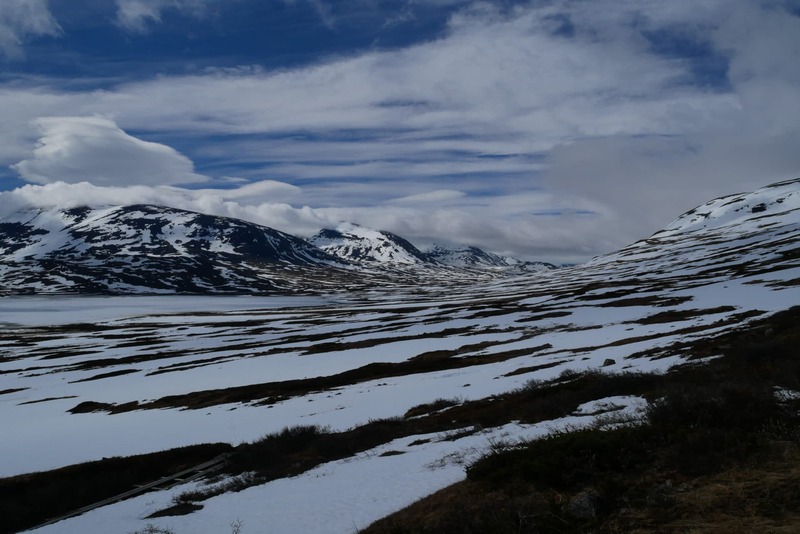 We had initially planned to follow the Kungsleden until Abisko but the prospect of being even more isolated is attractive. 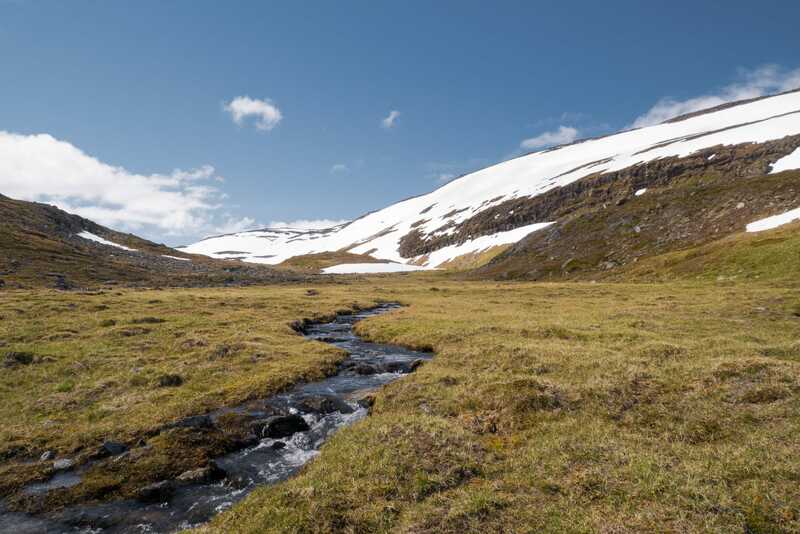 So we’re changing our plans to get to the Karsåvagge valley. 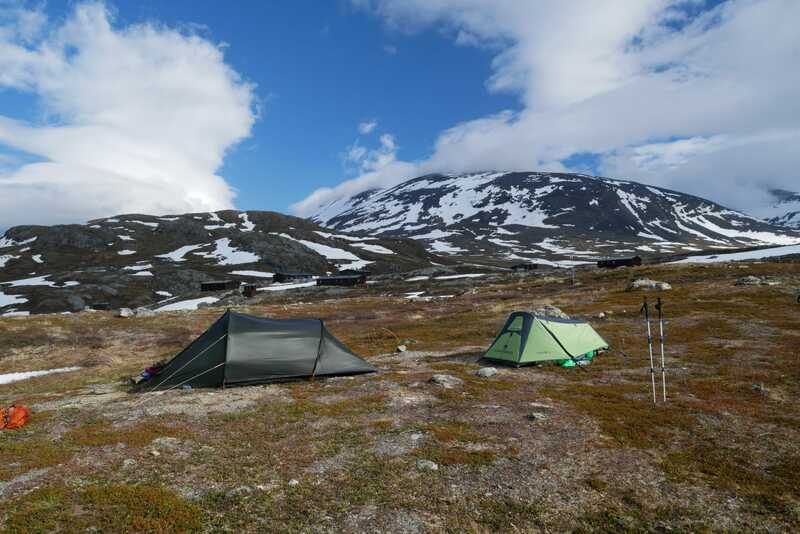 The beginning of the path is behind the camping site of Abiskojaure. We first go along the lake and then a small river. 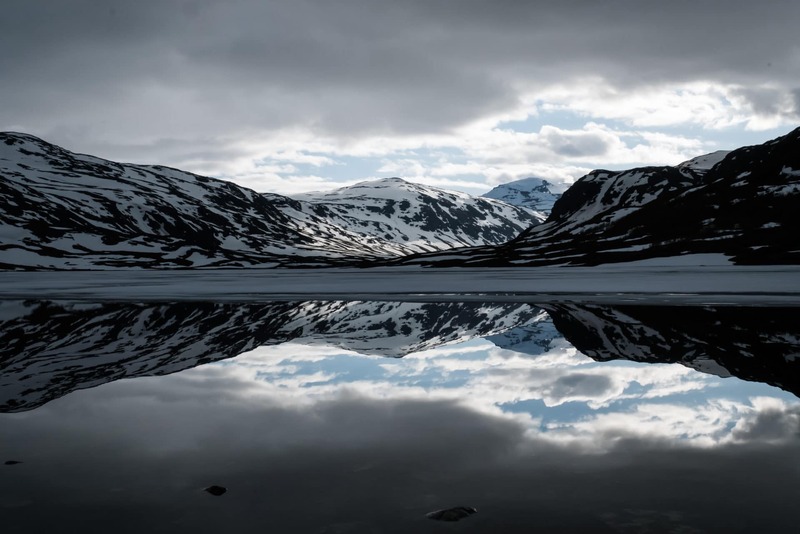 We quickly take the altitude and the view emerges behind us revealing the lake, the mountains around and on the horizon. It’s beautiful. 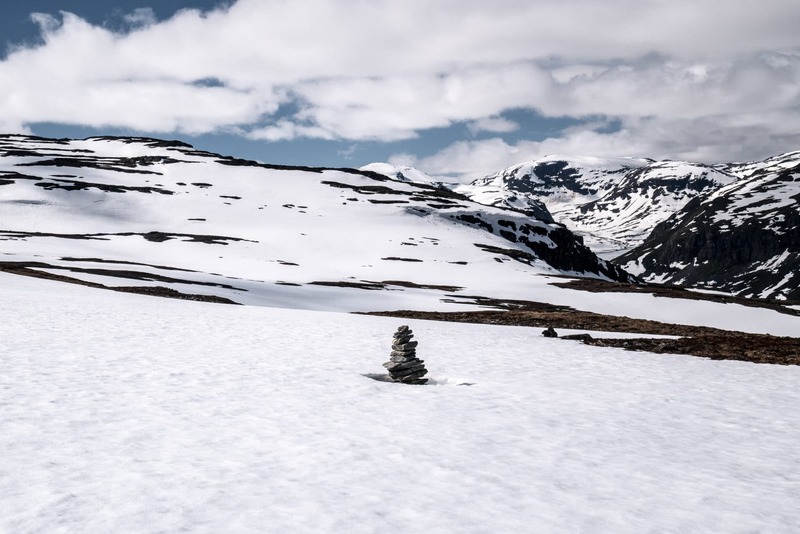 The snow quickly reappears, hiding a bit of the road, which is easily followed by the regularly spaced cairns. The path and the general atmosphere of the landscape are becoming better and better as the ascent progresses, there is an air of garden of Eden, intact nature, pure. On our right two herds of reindeers graze, on the left a small stream is running between the grasses. There is a great sunshine, we are alone, it is a very pleasant moment during which we were particularly happy to be there and to venture in a valley where few people have passed this year. 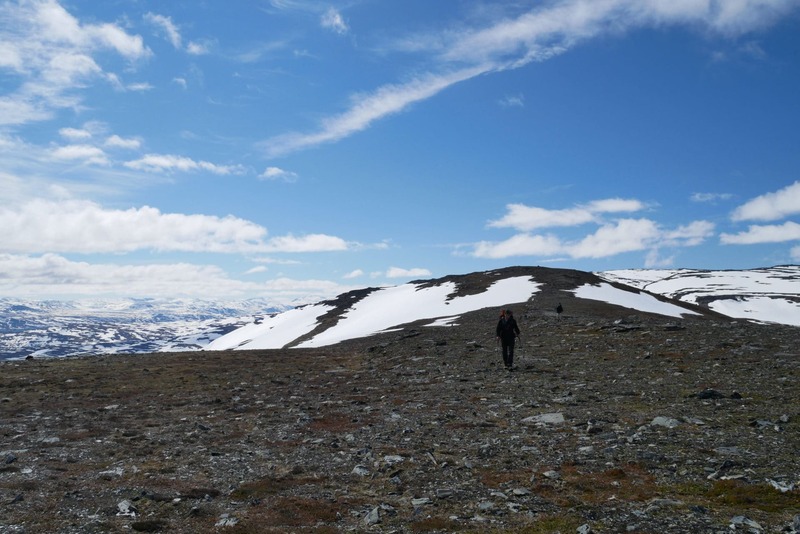 We arrive at the summit (which is quite flat and all in length) towards 1150m of altitude. 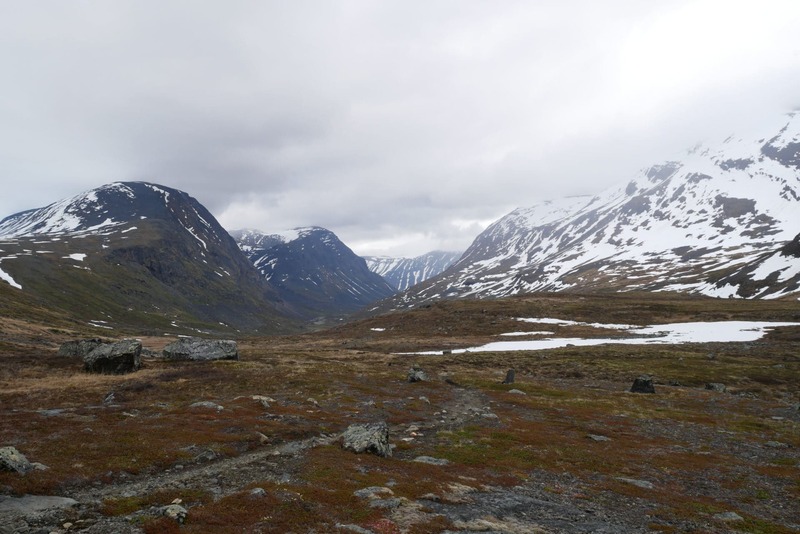 The view around is superb: to the south west the valleys from where we come and far the Kebnekaise. 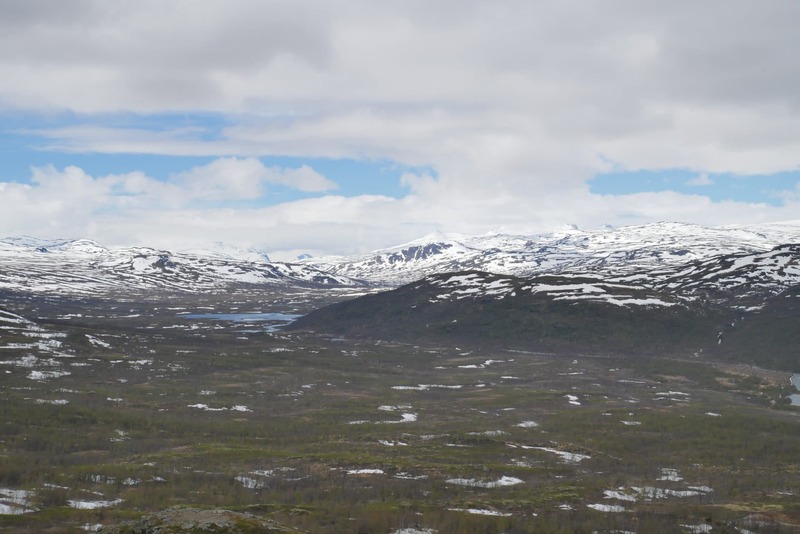 To the north is Abisko and Lake Torneträsk. We start the descent towards Kårsavagge. There is no traces anymore, the terrain is pristine from now on. The valley is particularly covered with snow, we see from here the lakes that are still frozen. There are some cairns to indicate the way. It is very beautiful. One has the impression, once again, to be alone in the world. 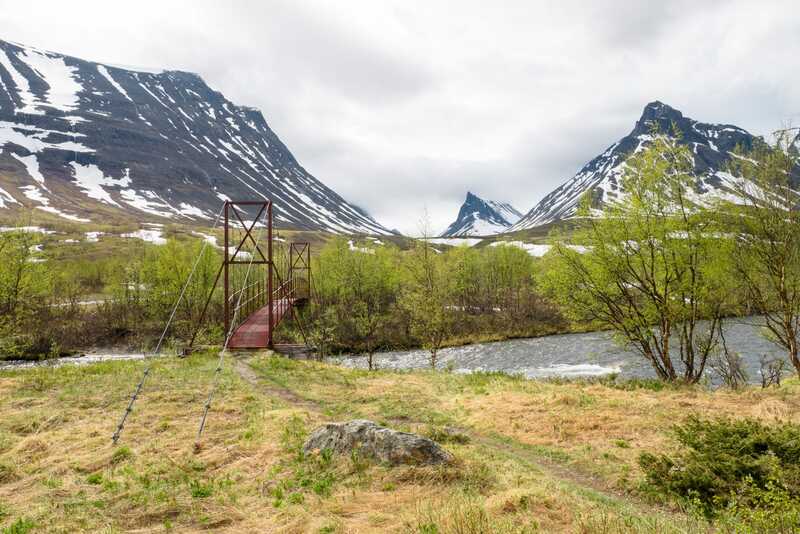 There is a path on the other side of the valley but you have to cross the river at the cabin of Kårsavagge. We will not take this option, instead we choose to remain from this side of the valley and progress off the trail. 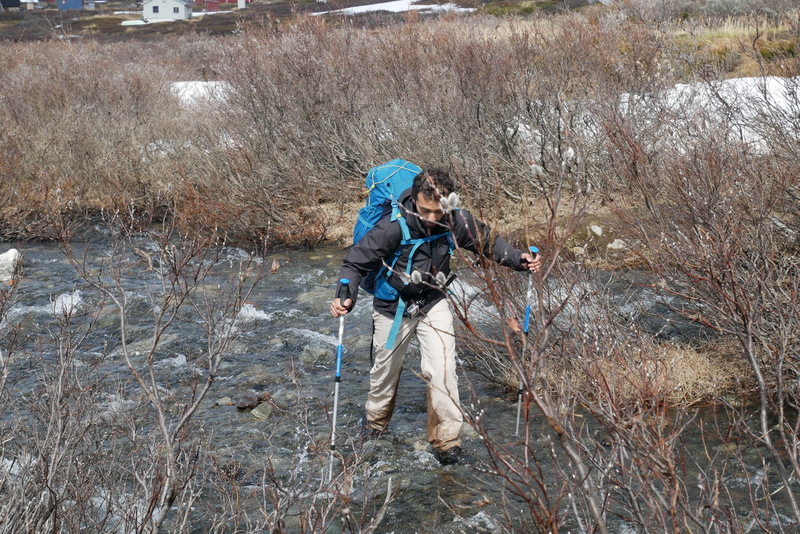 We turn then to the right at the level of the big river 500m after the summit. The descent is fast, we use the snow plates to go faster. 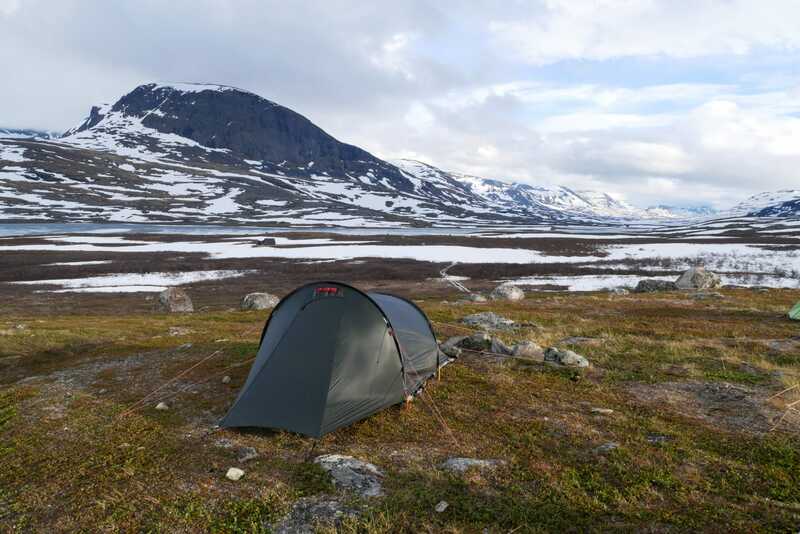 We will continue a little further time to find a beautiful camping location for the night. It will be done not far from the river to a place where his bed is tightened. 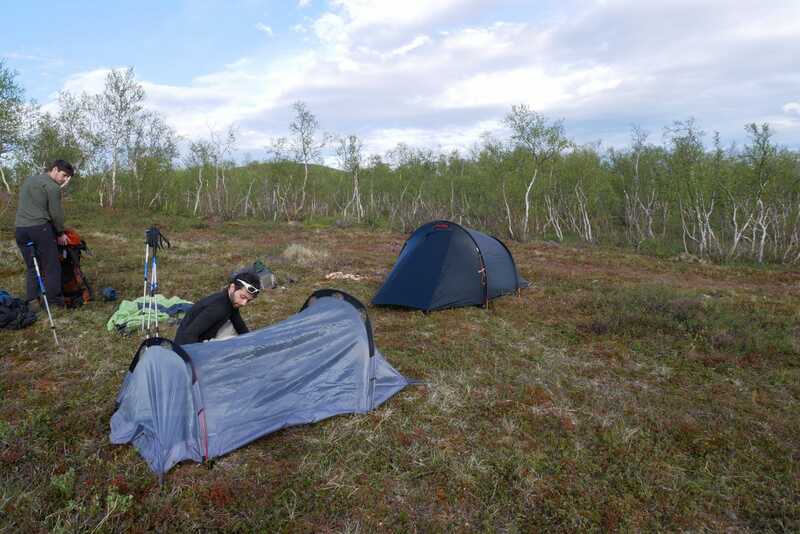 We are setting the camp for the last time because tomorrow we will be in Abisko. We are well installed even if there is a little wind. There is a small place to shelter to have a snack and to play cards. Late evening classic with meal, moment of fullness and beautiful light when the sun passes behind the mountains. Kårsavagge is beautiful ! 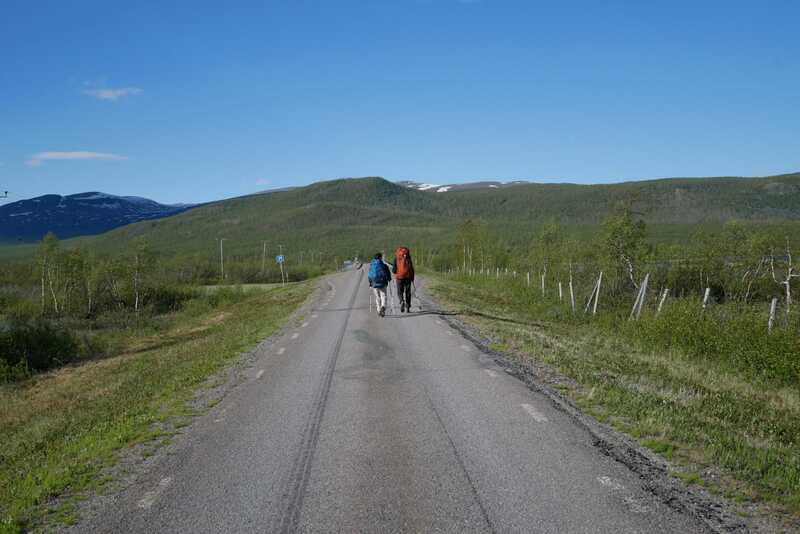 We are not far from the Kungsleden but we feel that here few people come. 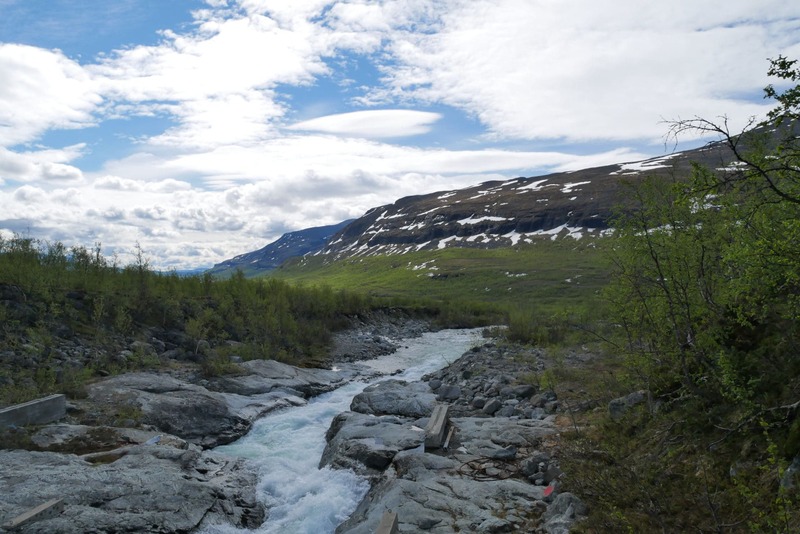 There is not much to say about the end of the path to Abisko. 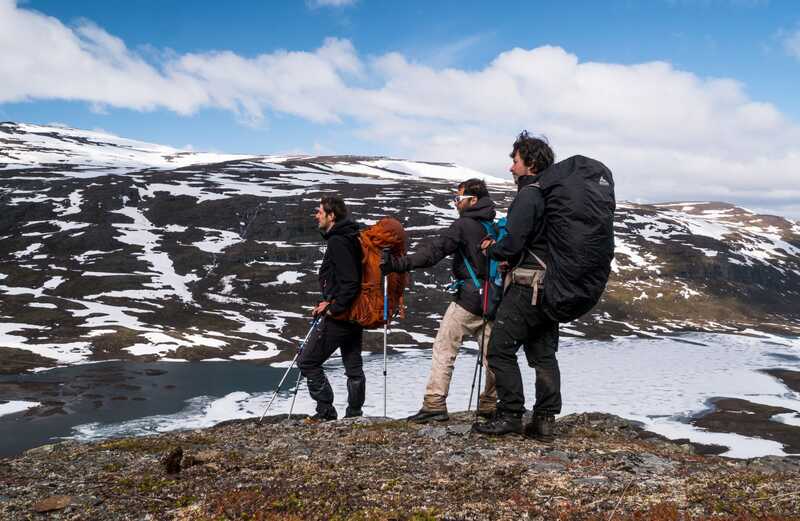 It offers a beautiful view of the Torneträsk and the surrounding peaks. 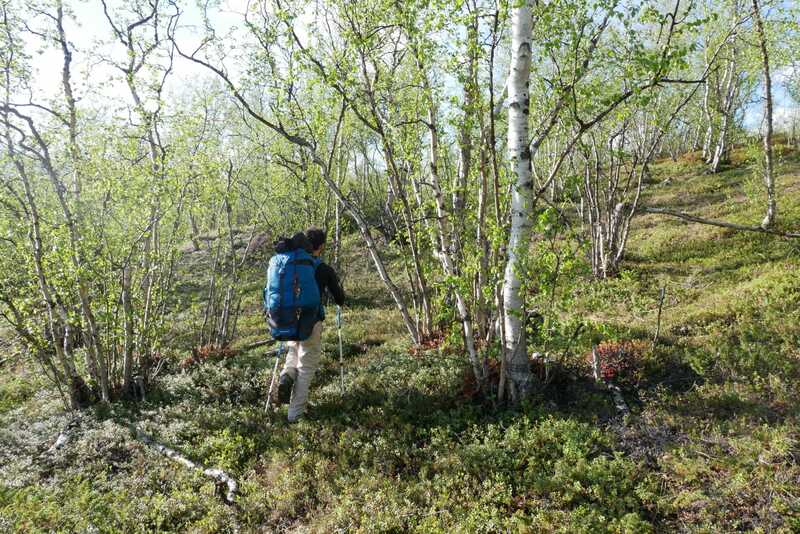 We finally join other paths traveled by tourists passing through Abisko. The civilization is beginning to be rediscovered. 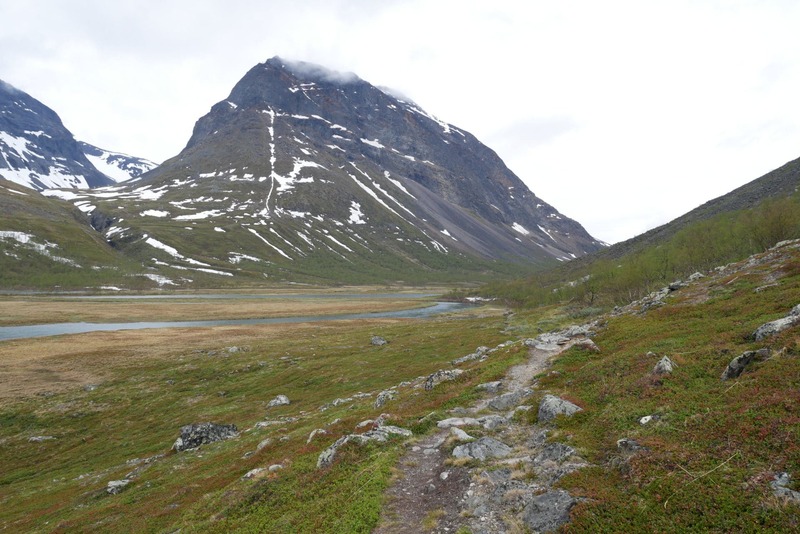 The end of the road leads to the road not far from the famous gate that marks the beginning or the end of the Kungsleden. We stop there for a photo. Here we are at Abisko! The shoes of Mattieu have held! Another trek that will be remembered. 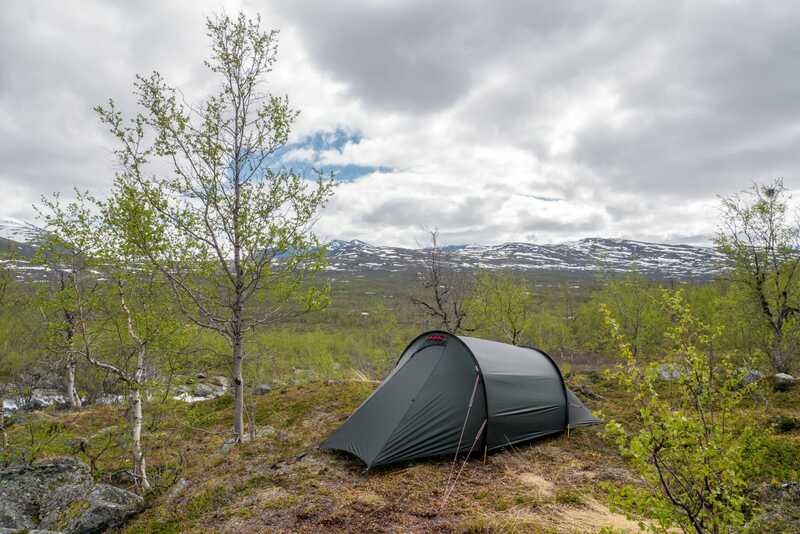 These ten days in Lapland were absolutely brilliant thanks to the landscapes, the atmosphere but above all thanks to the feeling of freedom and wild nature that one feels there. 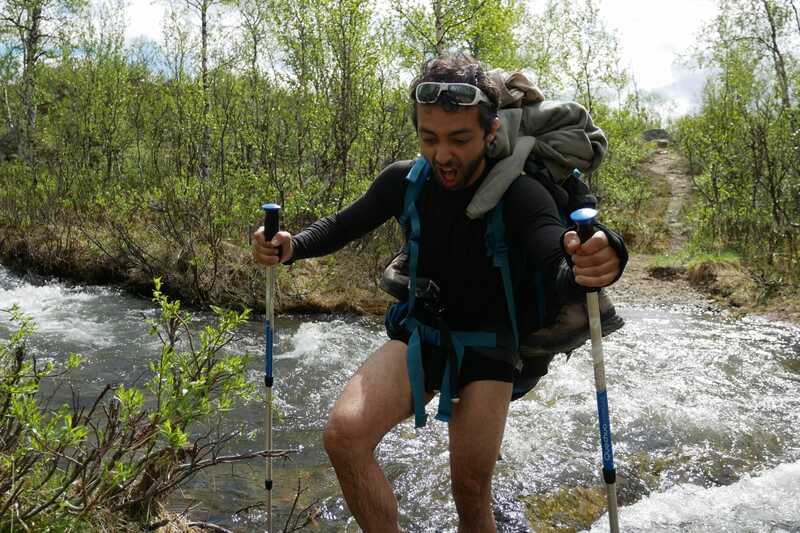 I had some apprehensions before the start on the nature of the terrain and the difficulties that we were going to encounter, apprehension confirmed on our arrival by the feedbacks that we had but now in retrospect, it was not so hard on the contrary. The moderate physical difficulty has allowed us to benefit even more. I am also happy because it was the first time I left with 10 days of autonomy in the bag and I even had some food left at the return. 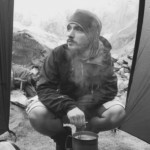 We can therefore think about treks of this duration or even a little longer with a bag of 65L well filled. I can only advise you to go and lose you a few days in these wild lands.